With lovely weather forecast for tomorrow, Mothering Sunday coincides with Hartland Abbey opening its gates for the season. 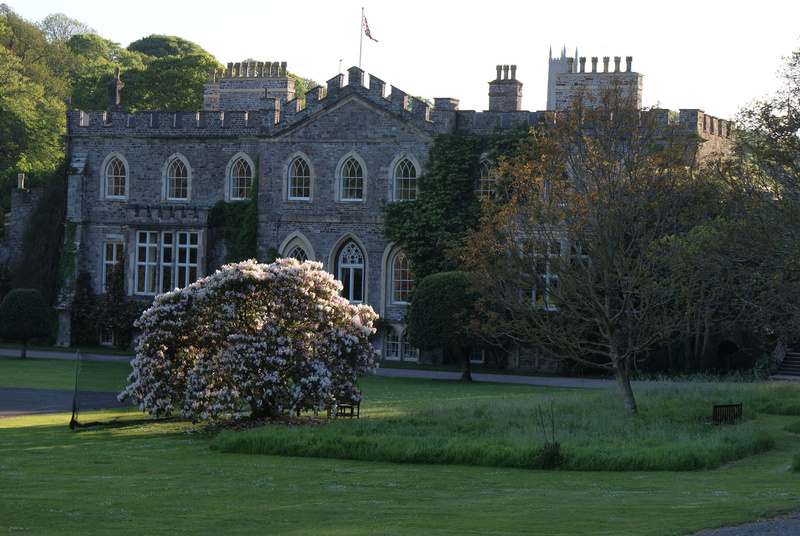 Ironically the daffodils are far better now than they were when we opened for Daffodil Day a couple of weeks ago and the gardens really are looking beautiful. 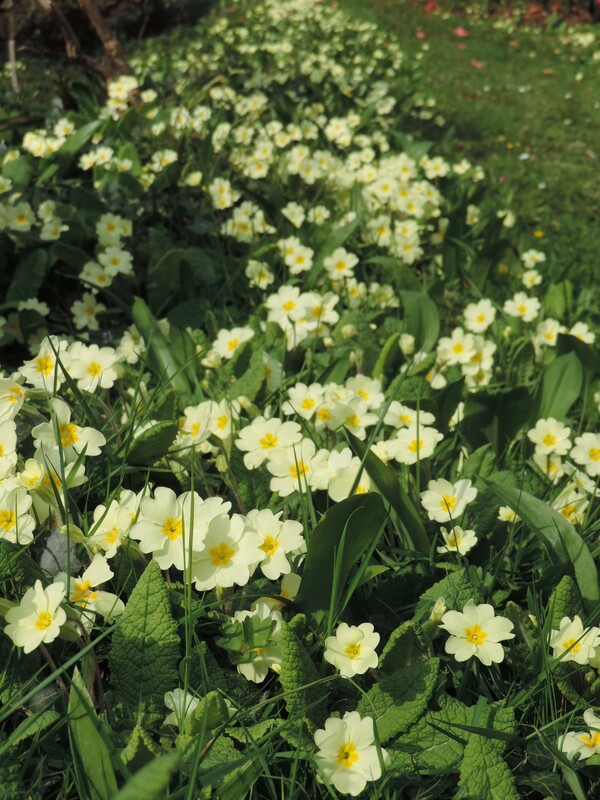 The primroses are better than ever, confirmed by Monty Don last night on Gardeners World! Delicious smells have been wafting up from the Tea Room kitchen where Jo and Kath have been cooking up some delicious treats for Sunday. Their food has been so good and they received plenty of accolades in their first season last year! 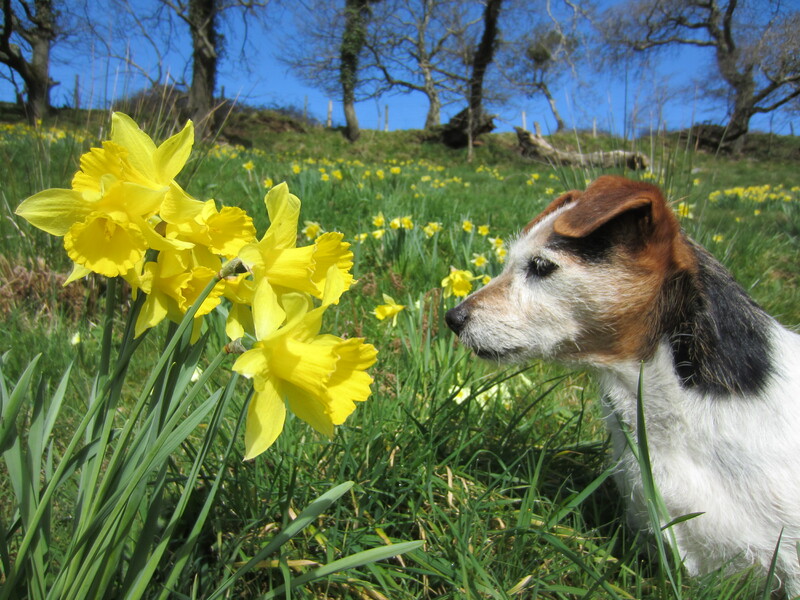 So many people and dogs came to Daffodil Day; thank you to everyone for coming even though it clouded over after a beautiful start to the day. It had been a nightmare getting the walks tidied up and safe after the storms but we all pulled together and with lots of bonfires we just managed to be reasonably tidy. Nigel has filled the house with some stunning flowers and Carol has the house looking lovely. Thankfully she has been on a very well earned holiday for the last week but will be back in action with the hoover on Monday! She is also the shopkeeper, a job she shares with Liz Hodges. They have to wear many extra layers of clothes to keep warm in the basement but they are always smiling! 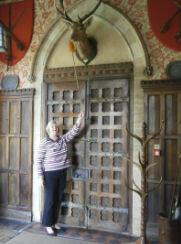 We are so lucky with our wonderful room stewards and our ‘chaps’ in the Payhut who are so helpful to the visitors. 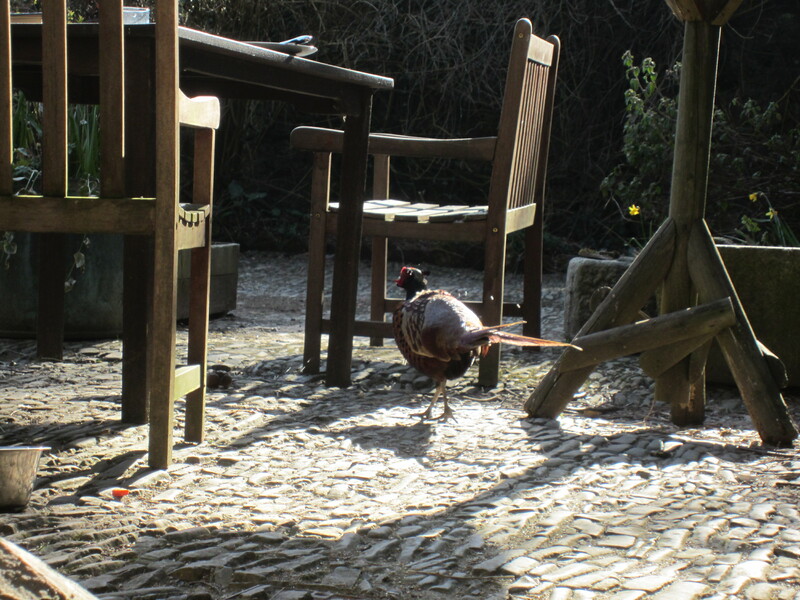 It is always lovely to see them back in one piece after the winter; we so enjoy their company and care that all is well. Behind the scenes Peter and Karen Senior have been cataloguing the Library. It is immensely kind of them both. Karen was a librarian so we could not be in better hands; we are hugely grateful. Our thanks to Stephen Hobbs too who beavers away keeping the website going, though sadly he is retiring at the end of the season. Many visitors have been guided by him, his knowledge of local history is huge. He is also our voluntary archivist and very good at putting records onto modern technology! We are a bit behind with the filmshow as so much time was spent clearing trees and not making the space, but all will be well soon. We might have use the nursery temporarily provided no one minds the grandchildrens’ mess! Also we are making some new display cases to house the diaries and travel journals of Sir H’s ancestors and my great uncle’s letters from WWI. 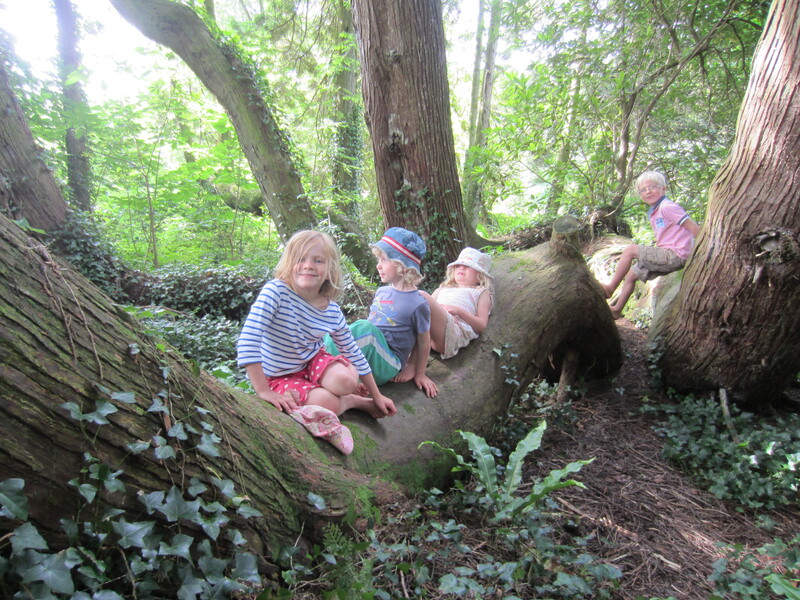 Our thoughts are now turning to Easter and for the first year we are having an Easter Egg Hunt in the Bluebells on Easter Sunday and Monday for our visiting children. Theresa, our wonderful, creative, Administrator (normal seen running about from coach to coach) has been thinking up some ingenious clues, all rhyming, and we just hope for good weather. I am trying to decide how many Easter eggs to buy as we don’t want any disappointed children, equally we cannot possibly eat hundreds of left over eggs! I am locking them in the larder so no grandchildren can get them first! Theresa is also busily making some lovely old fashioned games and I have seen her knitting needles and brown wool all ready to make some surprises! 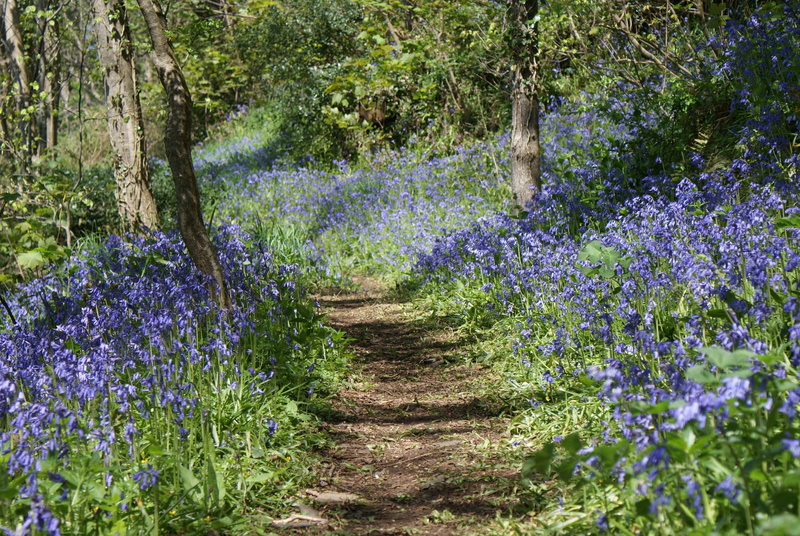 The bluebells should be looking beautiful as Easter is so late. As well, we will then have our Bluebell Sunday on the 27th April when we will have the reduced entry as we do on all our spring flower days. 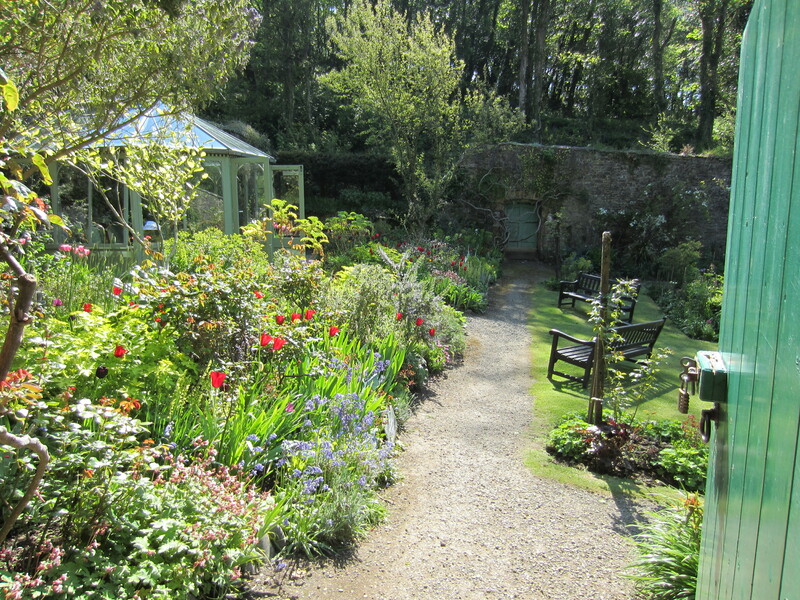 The foxgloves should be coming out then and April is such a good time for the gardens here. The walls round the Vegetable Garden are looking so smart thanks to a grant from the Higher Level Scheme. 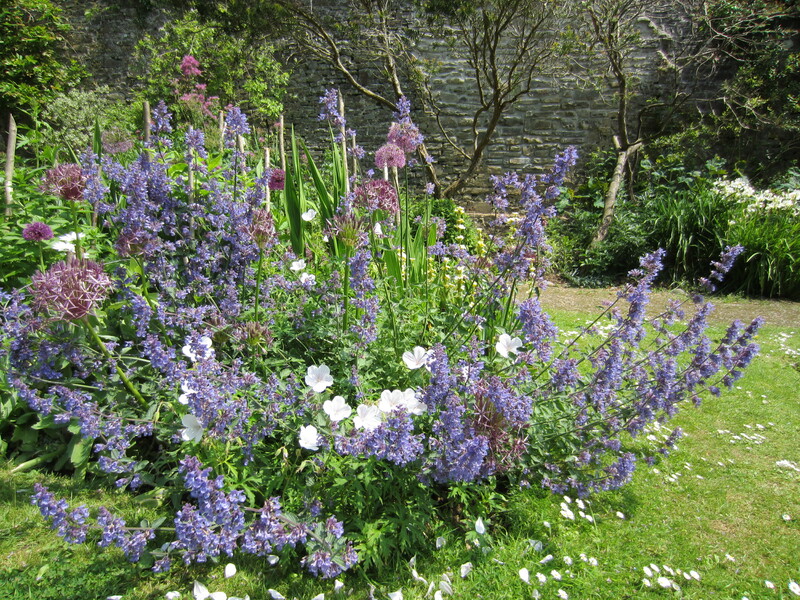 The coping on the top of the walls has been restored; it had fallen off in great chunks and a large buddleia population had established itself and basically the walls were not going to last much longer without emergency help. They do look a bit barer than usual but with the Hartland climate, normality will soon be restored! About two weeks to go before the builders disappear along with a hideous blue container that doubles as a shelter (with electricity) and a store. 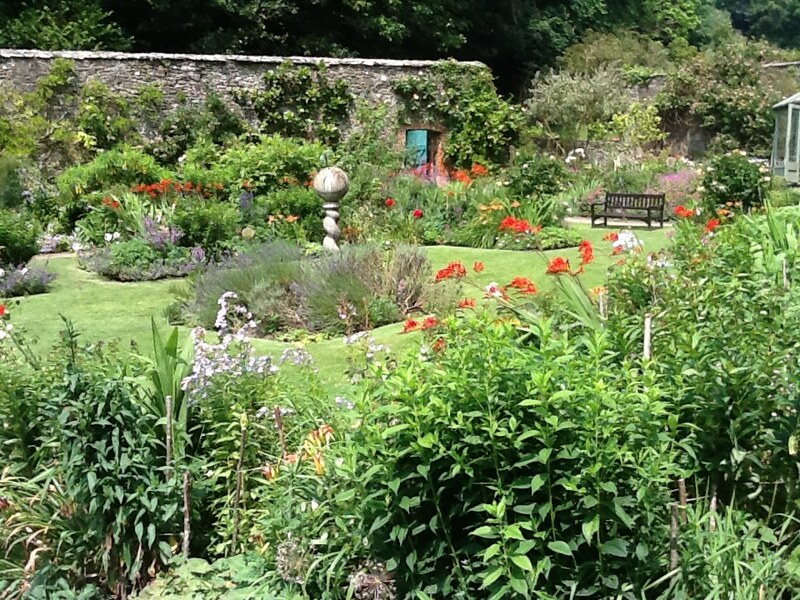 It does not really enhance the 18thC gardens! Nigel looks rather envious as they get inside for their coffee; poor old chap only has rather a dark shed with intermittent electricity but a lovely woodburner to warm up by. 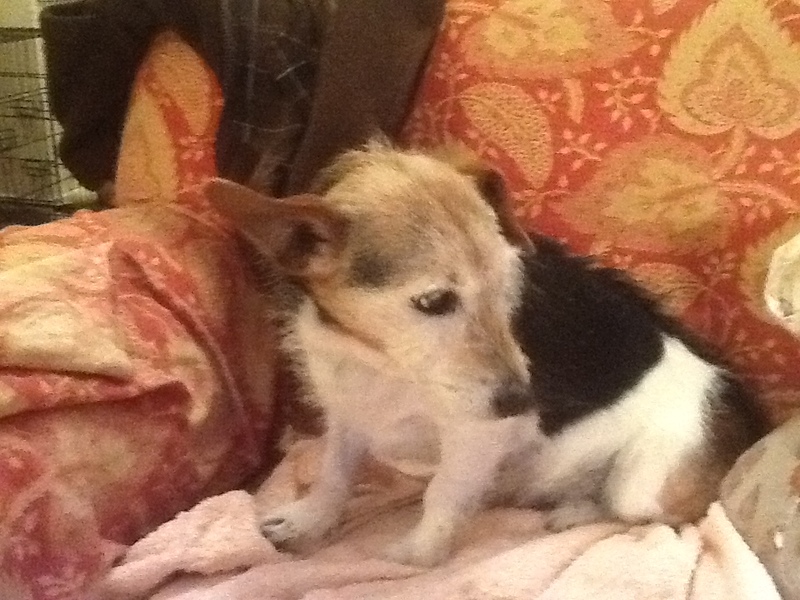 sadness; Alice my adored terrier and best friend for the past 15 years was staying with our daughter near Tiverton while we were away for the weekend. She decided she wanted to come home to the farm and just set off to travel 15 miles. Sadly, she never made it; she had not worked out how to cross the horrid North Devon Link Road. It was devastating, firstly for us all not knowing where she was and then finding out thanks to a kind man who had seen her lying by the road. She was on the direct line between us and our daughter’s house and would have made it save for the invention of the car. She was the most incredible character and I miss her dreadfully. She is buried in our garden which she spent most of her life digging up! Our visitors to the Abbey will probably have mixed emotions as many have seen her, always next to me while gardening, on a lead, as her teeth had a bit of a reputation! Other dogs were always greeted with the most awful growls but it was only Alice being fiercely protective. Life will never be the same without her. We managed to fit in a week’s holiday in March on a lovely island, La Gomera, in the Canary Islands. 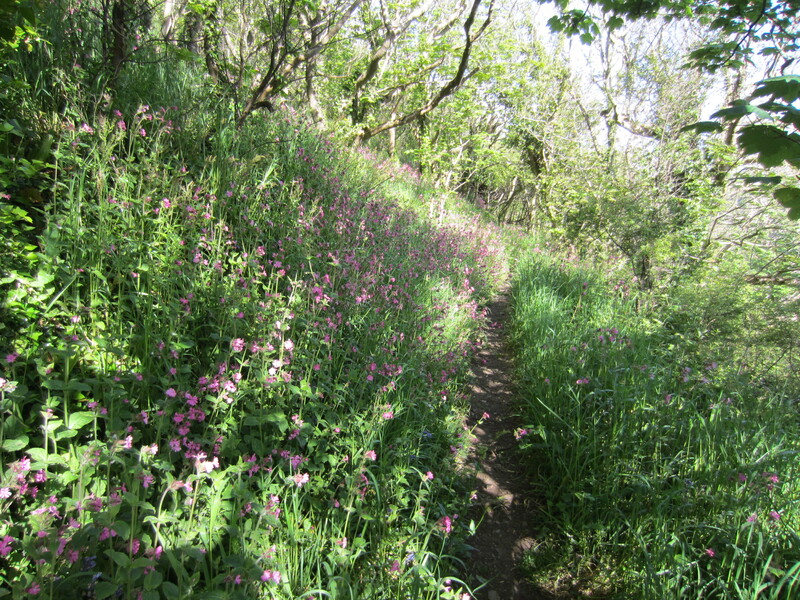 No people(or canaries) but lots of wonderful walks and wildflowers. A lovely rest. We also had a day at Cheltenham races and were thrilled to see our son in law finish third on The Giant Bolster in the Gold Cup. He had a wonderful week with three Festival winners on Dynaste, Western Warhorse and Ballynagour, all for his boss, David Pipe and the supportive owners. We have some incredible theatre to look forward to this summer. 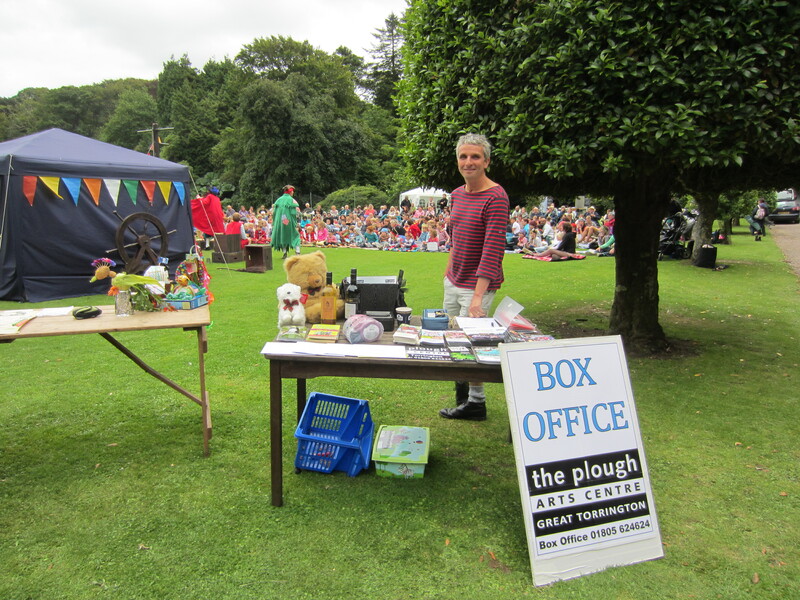 Richard Wolfenden-Brown, the-more-than-dynamic Director of the Plough Arts Centre in Torrington, has confirmed seven productions ranging from ‘The Tempest’ (lets hope the weather doesn’t match the description) to ‘George’s Marvellous Medicine’ for the children. 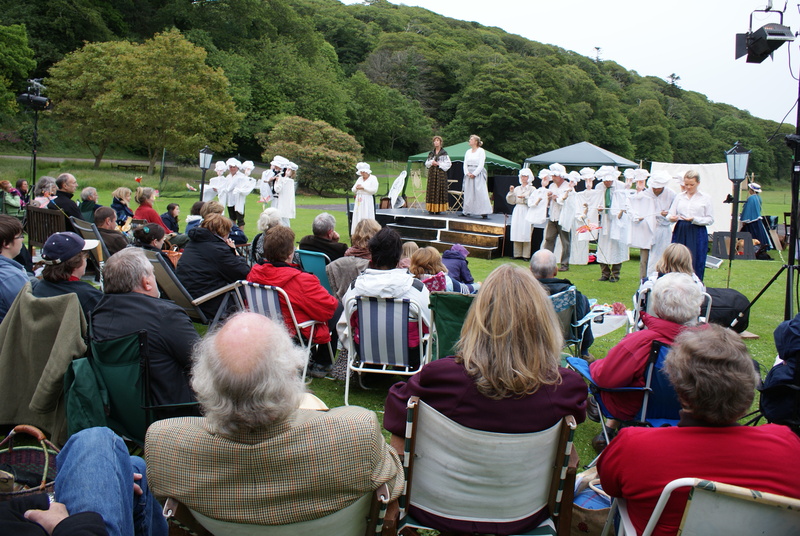 We have also been given ‘Candleford’, ‘The Pirates of Penzance’, ‘Robin Hood’, Alice’s Adventures in Wonderland’ and ‘Pride and Prejudice’. 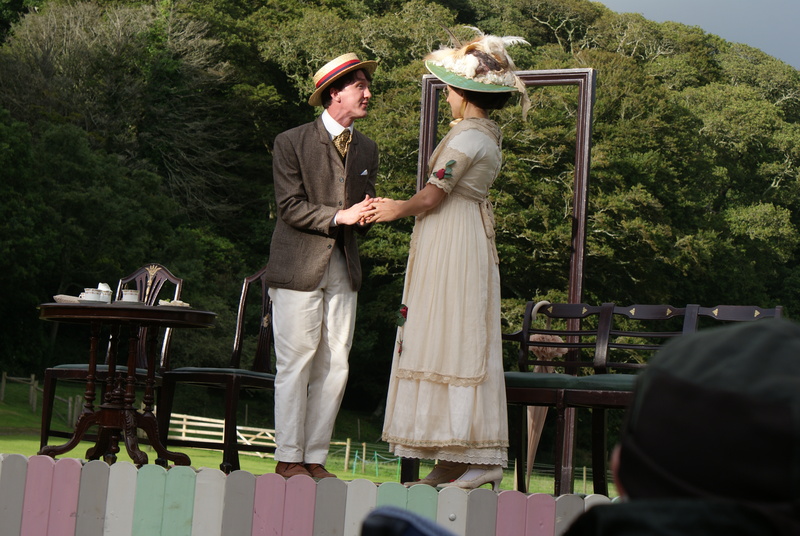 We are even having a matinee and an evening performance of Candleford. There is literally something for everyone. 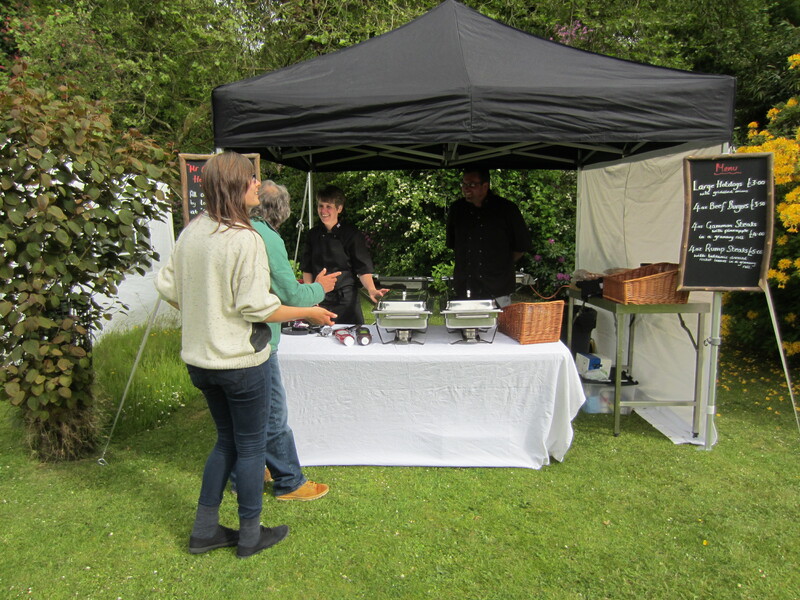 We will again be having the delicious barbecue and plenty of liquid refreshment! 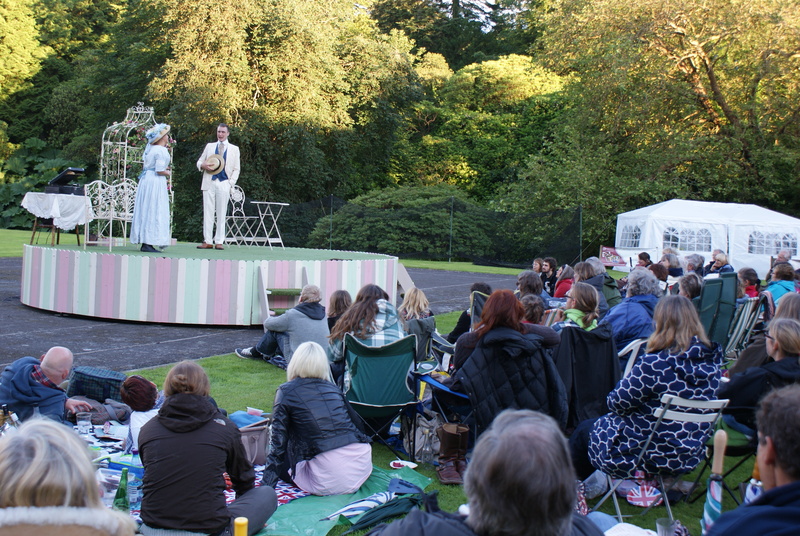 We are really looking forward to an entertaining summer on the front lawn. All the details are on the Hartland Abbey website under ‘Events’. 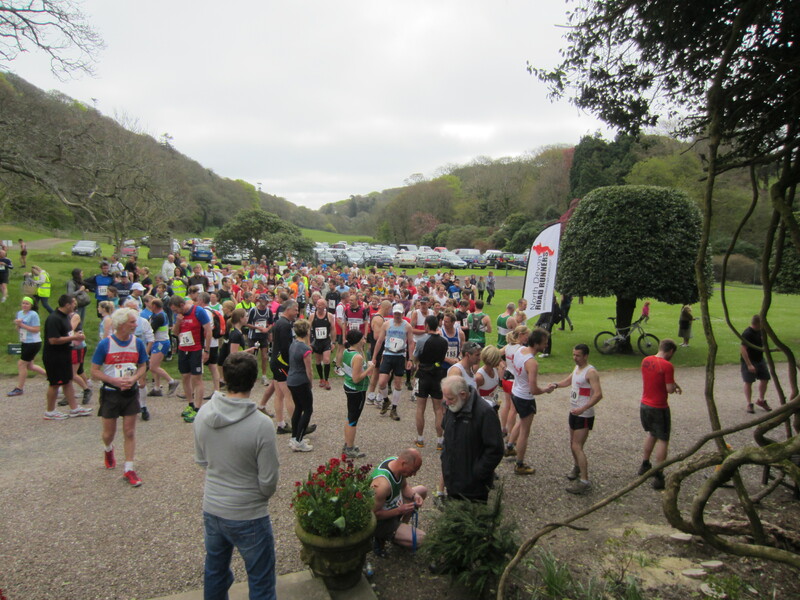 Finally May 4th is when all the supremely fit of North Devon and further afield amass at Hartland Abbey for the second ‘Hartland Hartbreaker’ cross country run. Starting at the Abbey with a stampede, hundreds of men and women attack the steep hills of the North Devon Coastal Footpath for twenty something miles of agony in order to raise money for The Children’s Hospice South West. It is a fantastic cause and we admire all these people raising money for the CHSW. Anyone who would like to donate to this wonderful charity can go to their website. The donkeys and black sheep with all their lambs will be back in the park next week. 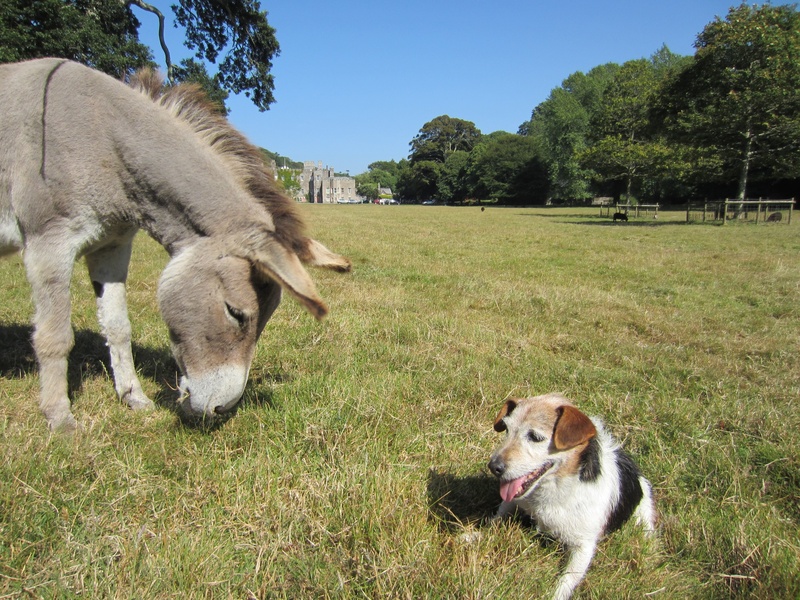 We can’t put the donkeys onto all the spring grass before the sheep come back otherwise they will get laminitis which is agonising; however the sheep can’t come back until the lambs are a tiny bit older otherwise they are just feed for the foxes and badgers which is very distressing. 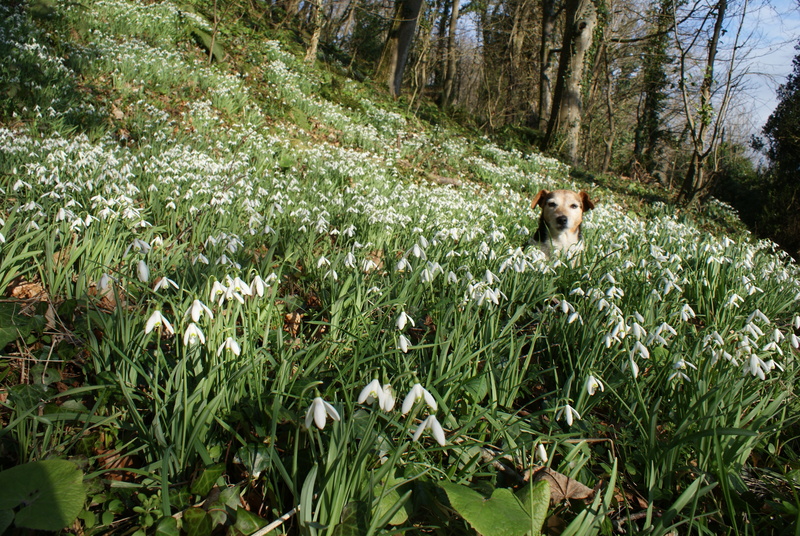 No Snowdrop Sundays but lots to look forward to..
and,usually, with lots of their four-legged friends! However with so many trees damaged in the storms which have either had to be cut down or made safe there are many impassable walks and paths. The car park is under water and the mud is horrible! Dave and Leighton spend nearly all their time clearing gutters and drains to keep the water flowing away from the bedrooms and the basement, which houses the museum, dairy and exhibition. It all takes up valuable winter time, reserved for important maintenance which will have to be shelved. 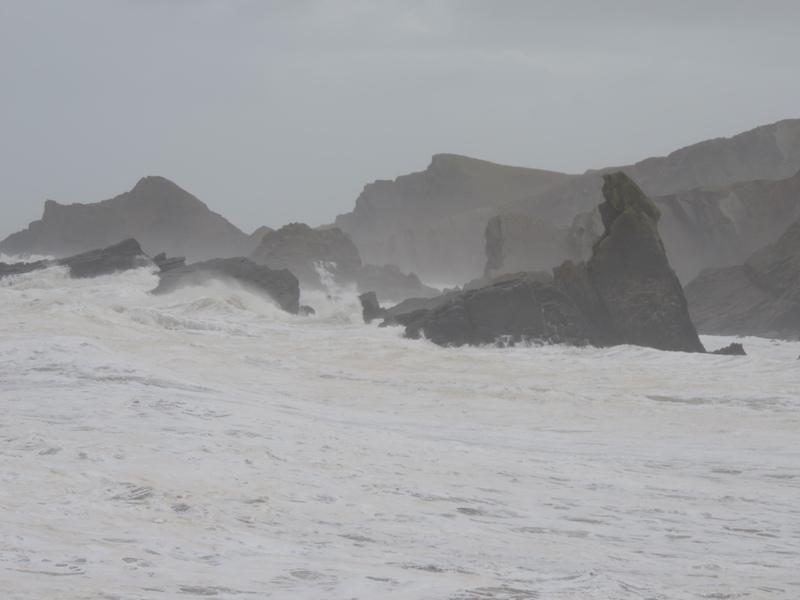 Hartland Quay is being battered on a daily basis by the 90 mile an hour gales but so far the damage isn’t too bad. Bits of the slipway wall have fallen off and a few slates here and there but considering the force of the battering it is standing up well to the elements, thankfully. 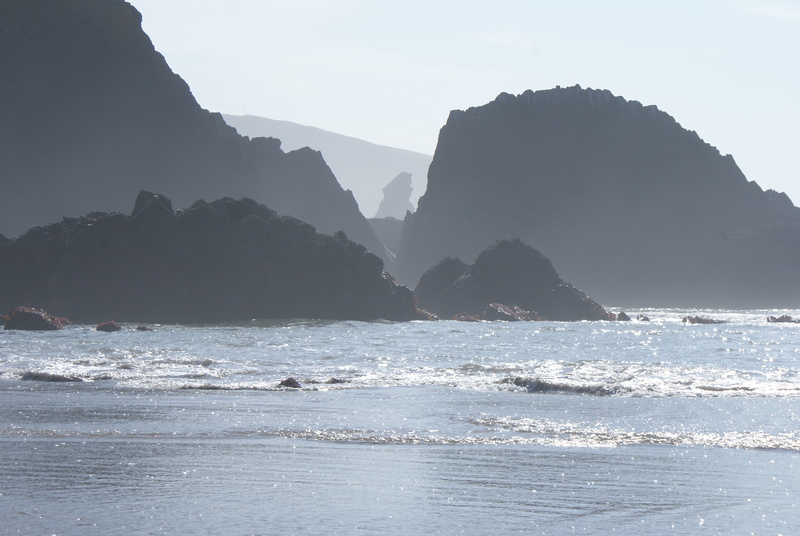 What a difference a few months make when looking at the photographs of Bear Rock at Hartland Quay! 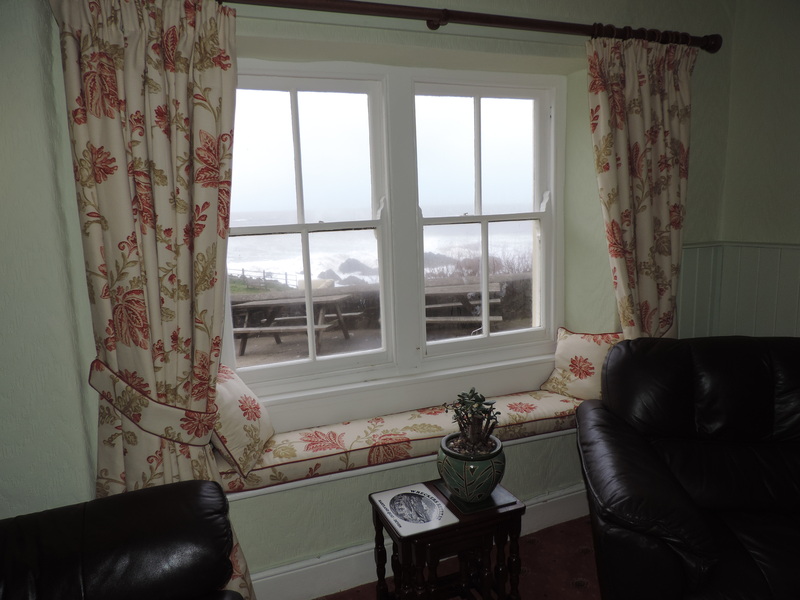 Lovely new curtains and windowseats at Hartland Quay. Jill and Chris, the managers, are doing a fantastic job decorating the rooms. The lounge is so smart with its new curtains and lovely window seats all made by Sue Macdonald from Philham. She is a brilliant curtain maker and is also responsible for the lovely new curtains in some of the bedrooms at the Abbey. Sitting in the lounge window in the Quay Hotel, beside the fire, is the best place possible to watch the enormous seas crashing over the rocks in winter. suffice until there is enough in the pot to do the job properly! It is a vital greenhouse which overwinters all the tender perennials and grows tomatoes in the summer and has been there for at least 100 years. Thankfully, so far, we have had only two nights of light frost all winter so nothing has suffered from the cold. 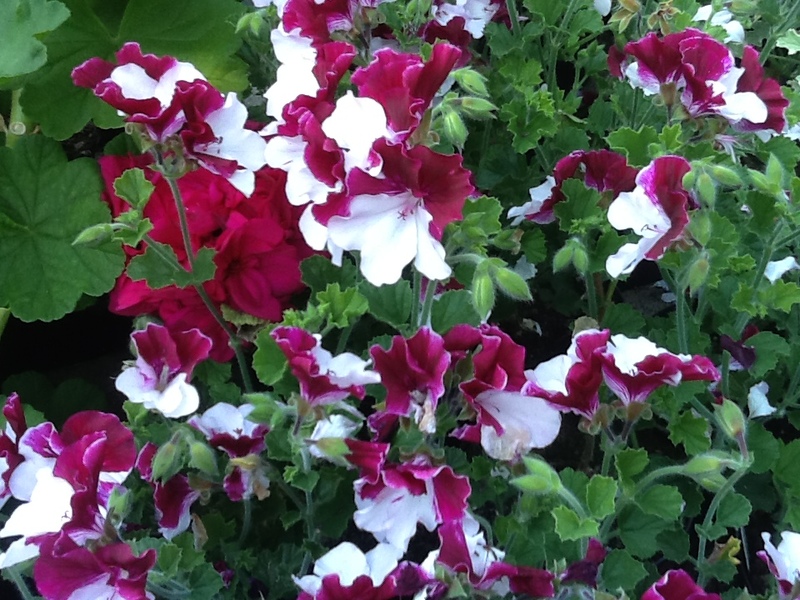 the heavenly scent fills the air. 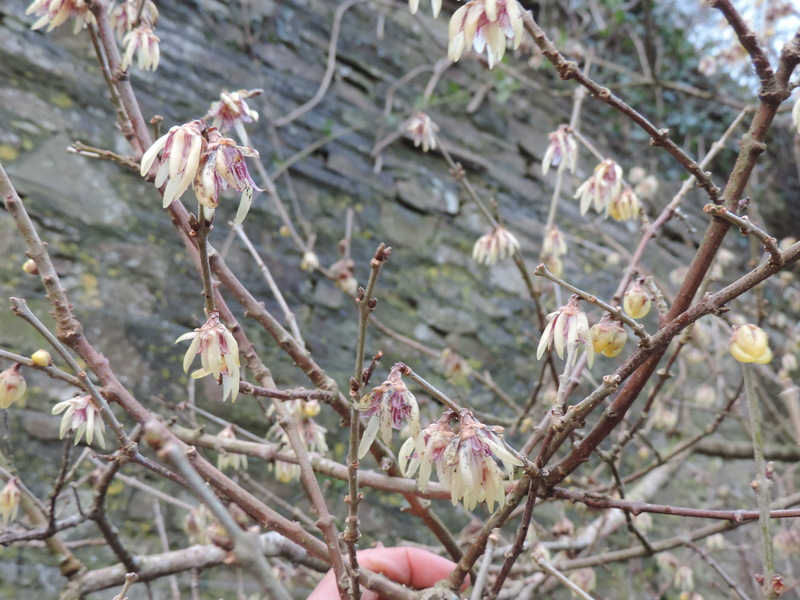 It is a lovely moment in January when I can pick the first sprigs of these treasures and bring them into the house. They are not the best lookers but my goodness they give such pleasure. Vita Sackville-West, in her wonderful Garden Book from the 1950s, extolled their virtues. The camellias are covered in flowers but it is almost impossible to appreciate their beauty in the lashing rain! All the snowdrops and crocuses are appearing fast and the daffodils are looking promising for our Daffodil Sunday on March 16th. 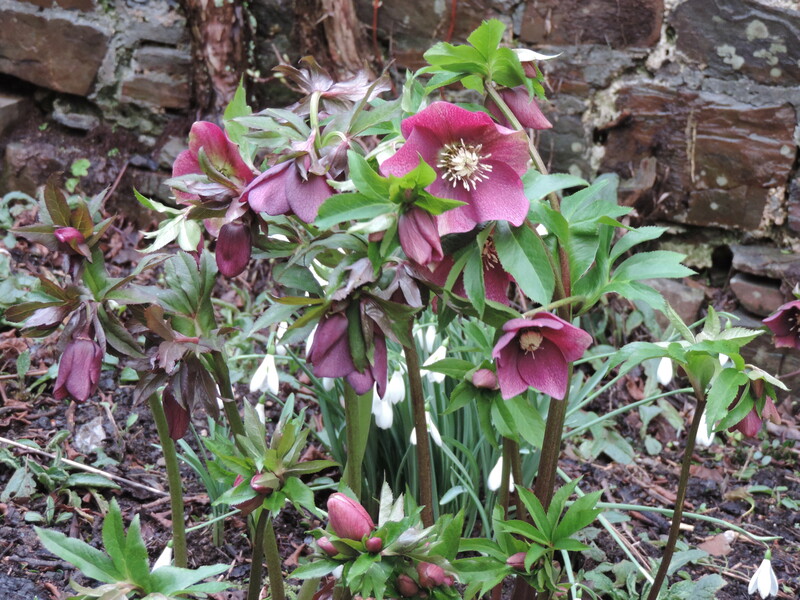 Hellebores are out in the garden now. 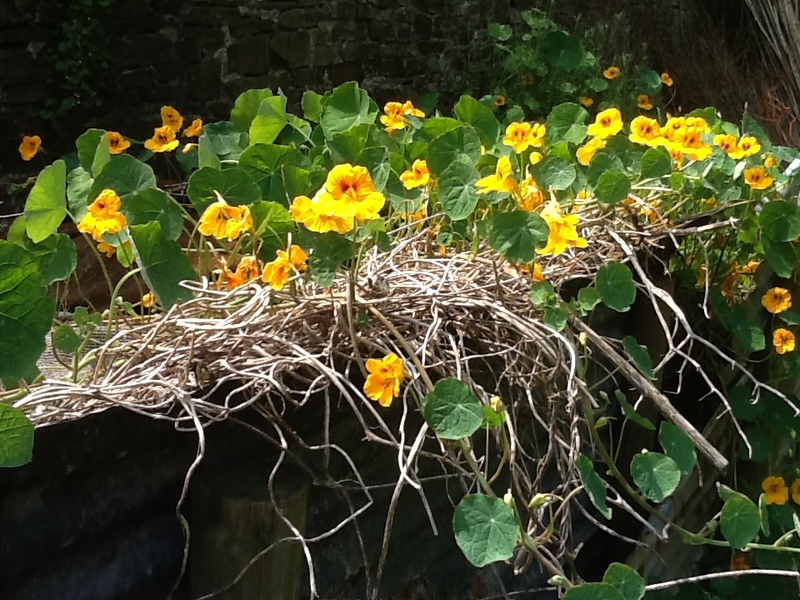 careful with all our precious plants in the borders. 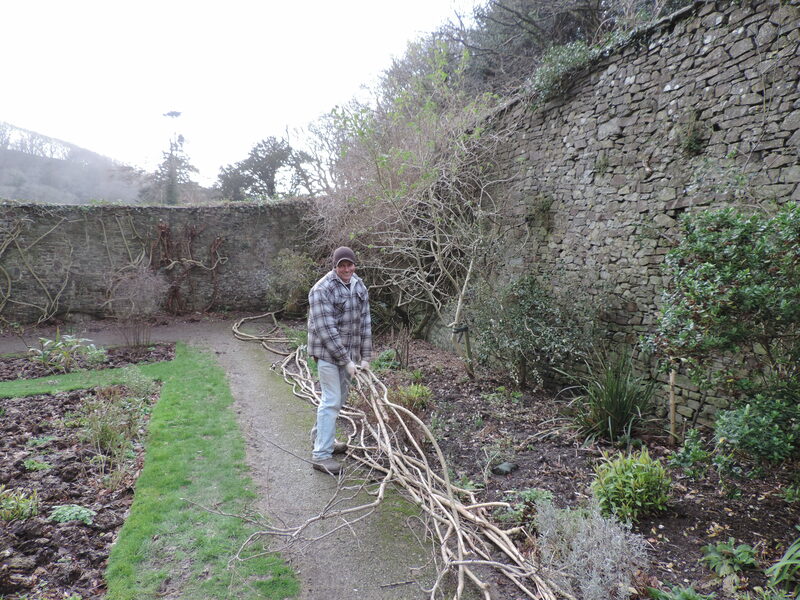 Nigel and Sam, the gardeners, have had an awful job lifting the wisteria tendrils off the top of the wall. Over 150 years old and the length of the wall, about 20 metres long, they now lie like snakes on the path. No one is sure how to get them up again as they are so heavy! There is so much maintenance to be done in the winter and just not enough time and manpower to do it during the time we are closed to the public. For many years Leighton, on his own, has performed miracles but now anno domini is catching up and everything takes that much longer. Poor chap, every time he starts a vital job another tree comes crashing down or drains need clearing and then he has to get the chainsaw out again and that is at least a week of vital time gone. Blackpool Mill in better weather! and chair covers washed and walls painted. We want all our guests to feel as though they are the first in the cottages, all through the year! Debbie and Anne, the housekeepers, are wonderful and do a great job between lets. It is not always easy for them if there has been an untidy family who leave late, but they work wonders. St Margaret’s Hospice shop in Dulverton has the best selection of puzzles and books of any charity shop and whenever I pass it I always call in to add to the cottage libraries! We think it is essential to have lots of good books for those wet days when guests want to curl up in front of the log-burning stoves or to lie in the incessant summer sun in North Devon! 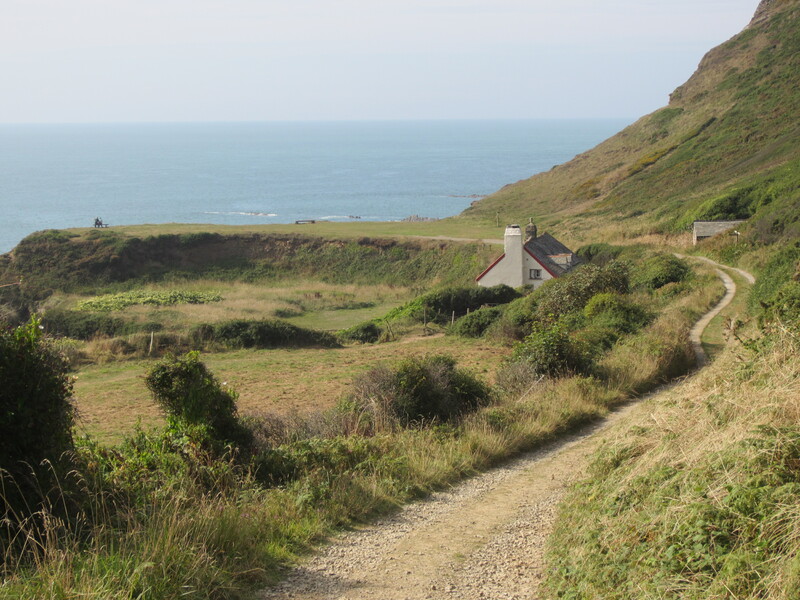 We still have the February half term weeks available and even if this extraordinarily wild weather continues the cottages are fully central heated and have lovely wood burners to curl up in front of after some really good stimulating walks along the coast. You will definitely get a reduction!It is time to redo the Abbey leaflet for 2014; always an exciting and worrying combination! Exciting to change the design but worrying in that it has to ‘sell’ the Abbey for the forthcoming season and we mustn’t forget to put in all the new events which are still not sorted out. 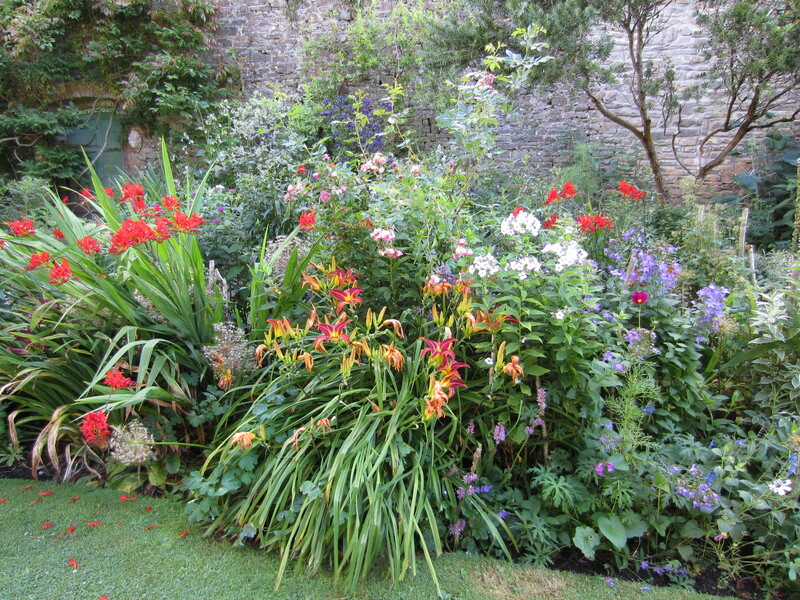 My computer is so full of photographs which are less than well organised and trying to find that vital ‘magical’ image of the garden that someone took in July is not so easy! early spring flowers in the gardens. 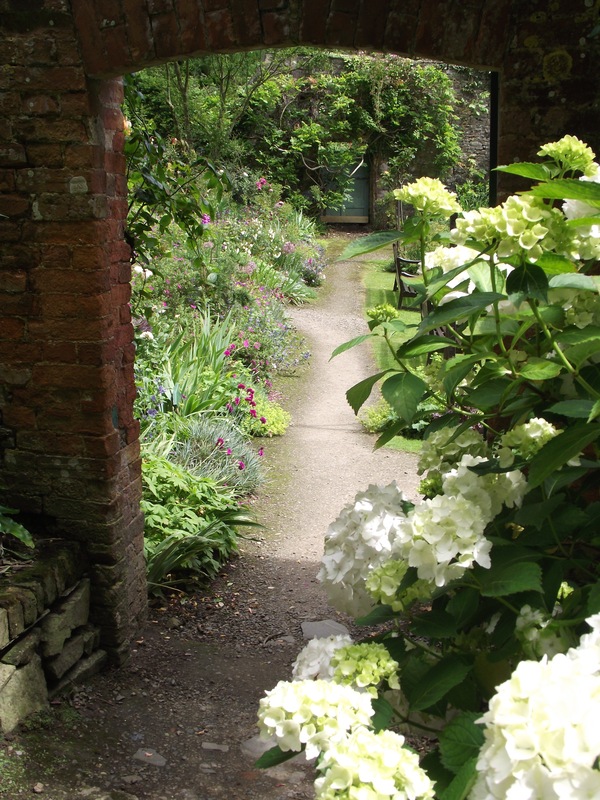 It is a lovely time to visit before the opening season proper starts and is a great chance to come in at a reduced price which also admits visitors to the museum, William Stukeley Exhibition and the shop. The house is open too at a small extra charge. 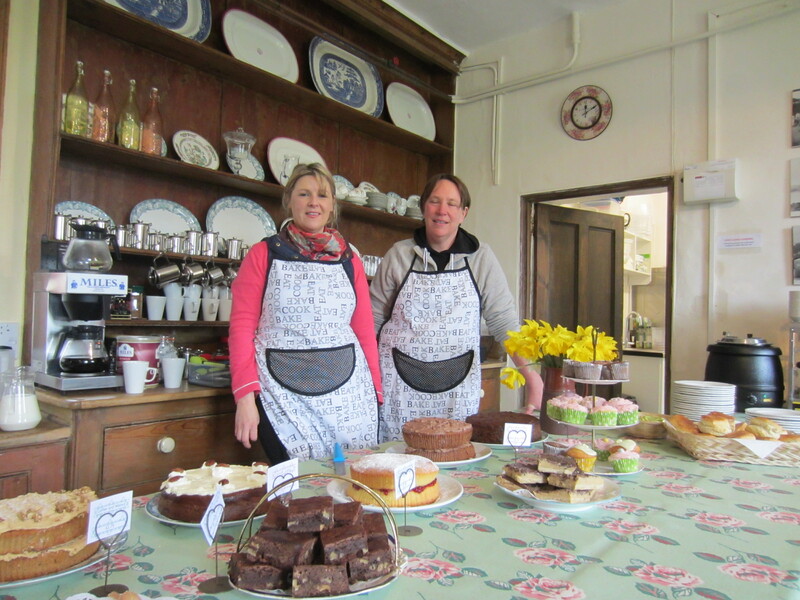 The Old Kitchens will be open again for the first time this year; after such a successful first season we are thrilled that Jo and Kath will be back in their pinnies again serving their delicious homemade lunches and cream teas. 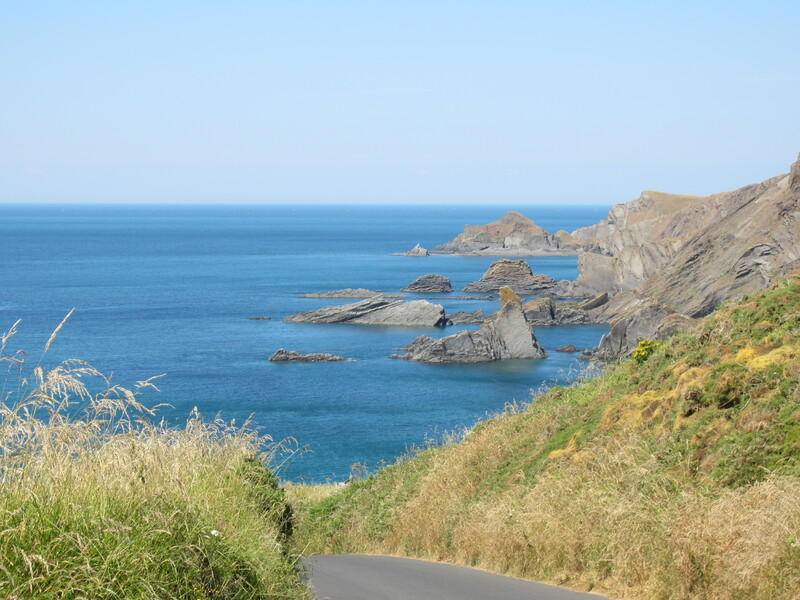 In addition there will be hot soup and hot pasties which always assures boiling hot weather! They did such a fantastic job last year and we are thrilled they want to continue. Passing the Tea Room always made us feel hungry at the sight of the scrumptious cakes! the wonderful Children’s Hospice South West. It is open to all but you need to be seriously tough and fit! 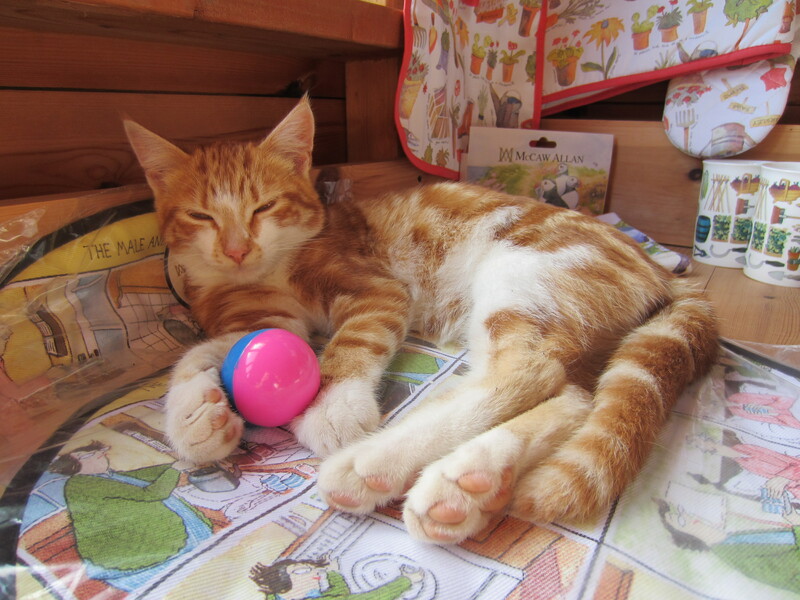 Last, and certainly not least, news on Timmy, the ginger kitten who many people met last year in the kiosk. We were so worried that the dogs would eat him up which they had almost succeeded in doing once, but with great care and a lot of threats to the dogs as to what would happen to them IF they ate him up, everyone is living very happily together now, thank goodness. Timmy now rules the roost and the dogs give me very old-fashioned looks as if to say ‘do we really have to have this thing in our house’ but Nellie, the puppy, and Tim have wonderful games together. During this horrible weather he is definitely not earning his keep, keeping the mouse population under control, and we have had to have a few words with him on this as cat food is very expensive and we do want to see a return! 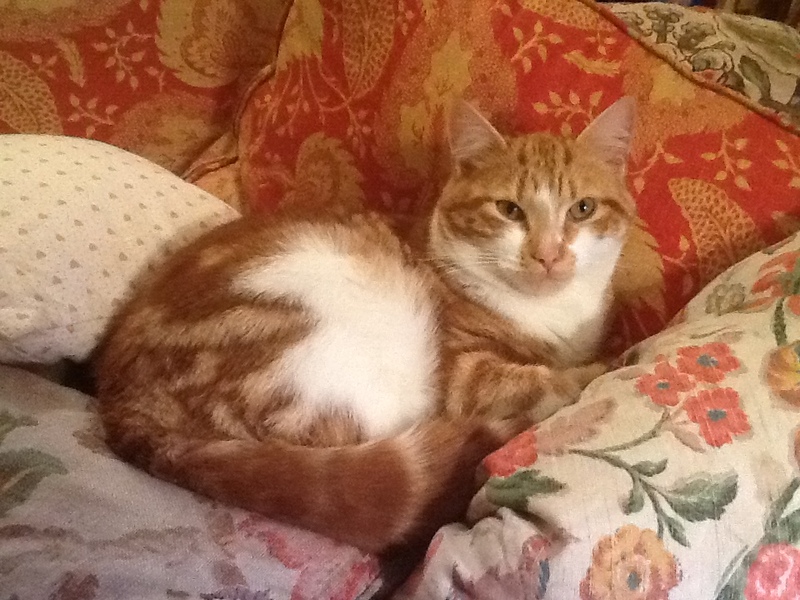 However he has taken no notice and spends all day and night curled up on the sofa while the mice run riot. Hopefully he will be in the kiosk to welcome evryone this year but not on the days that Mick mans the kiosk – he is not too keen on cats! Colin, however, loves them! Do come and visit us and have lots of fun. 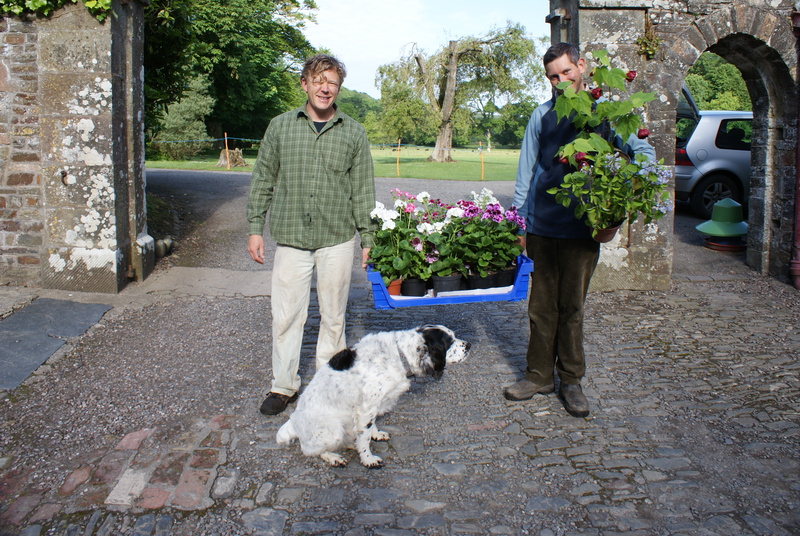 We so enjoy meeting our visitors and do all we can to make a happy day for everyone who visits Hartland Abbey. ‘I don’t want to share my sofa with a cat’. Timmy having a holiday from mousing. that experience which our visitors have enjoyed all summer. 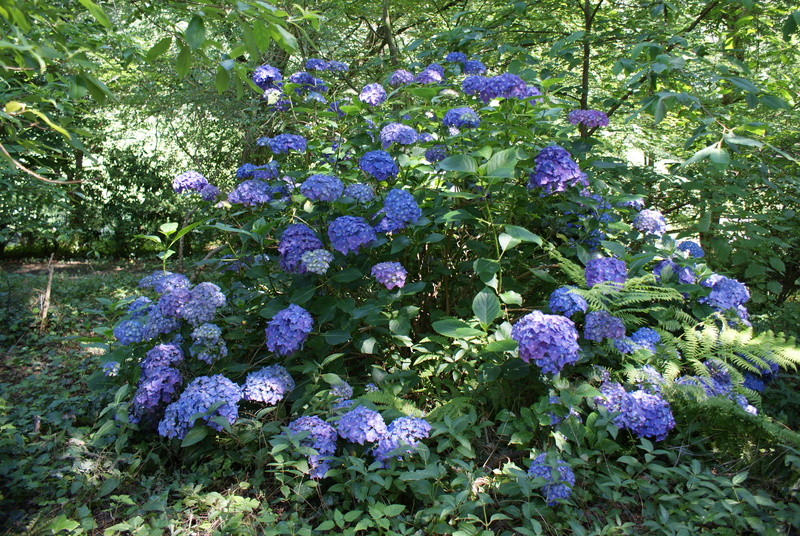 Last year, with such awful weather, there was never a day like this with the late summer scent of the buddleias and phloxes wafting through the air. It is the smell of hot summers of childhood, just before we went back to school for the autumn term. The sensation never leaves you. 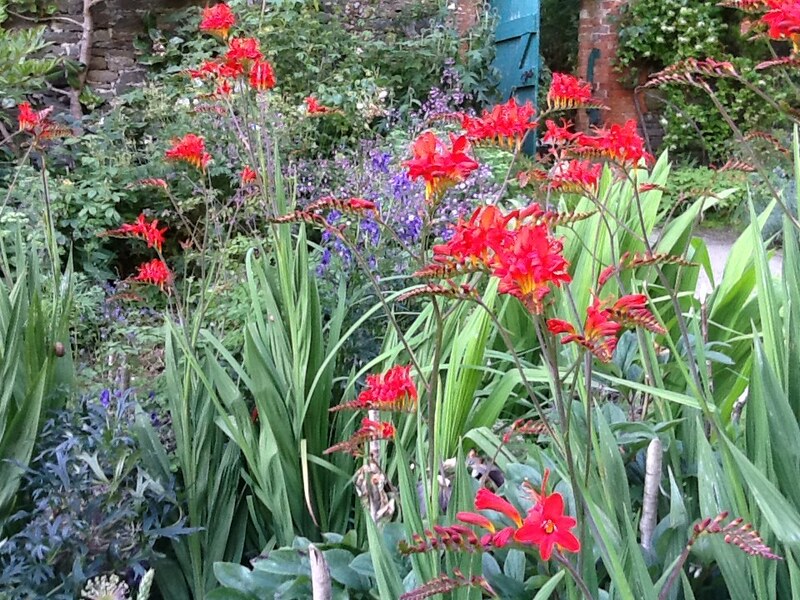 The phloxes, roses, honeysuckles and jasmines all combine to fill the air with a heavenly scent and beautiful colours so enjoyed also by this year’s hatch of fritillary butterflies. The purple artichoke flowers are heaven for the bees. The whole atmosphere is so comforting in this beautiful, warm, low sun. what a fulfilling and peaceful task. Under the lavender the grape hyacinth are already appearing, a stark reminder that we have to endure winter before we see these little blue jewels appearing in spring! There is no noise here, just the buzzing of bees to keep me company. It seems such a far cry from some moaning Minnie who visited us in June and wrote rude things on the awful Trip Advisor about the temperature in our house! It was the coldest June on record and yet some people arrived in tea shirts and expected the Abbey to be at 80 degrees; if they had to foot the heating bill they would soon realise why we wear warm jerseys instead of ordering more oil! Anyway all those memories are a far cry from the wonderful summer that we are still enjoying. The doors in the garden are so smart now. Leighton has done a wonderful job with a pot of green paint. Hopefully the walls will be mended this winter, then we will be really smart! sharp milk teeth. She is adorable but very naughty; her favourite amusement is chewing a squeaky plastic effigy of Boris Johnson with a shock of bright blond hair! Madge has been her nanny since she arrived with us and like all the best nannies has enormous patience. Alice just looks grumpy and is put out by the influx of youth at the Abbey. The peacocks are very curious. Both Tim and Nellie love all the attention from our visitors and are extremely spoilt! macs! The Hartland Carnival at the beginning of August is always a big highlight of the holidays. That such a small community could put on such a brilliant show is extraordinary; the floats are enormous fun and the result of a lot of hard work. The children love it and we all have fish and chips and (for us) delicious local cider! Apparently, it is the best carnival west of Bridgewater! The streets of Hartland are filled with people and all the money collected goes to worthy local charities. The ‘William Stukeley-Saviour of Stonehenge’ Exhibition has been popular with our visitors and many have asked for an accompanying book. Perhaps a good project for this winter but I think I need to hide for a month in order not to be disturbed! I will have to ask David Northmore if he is feeling energetic too! 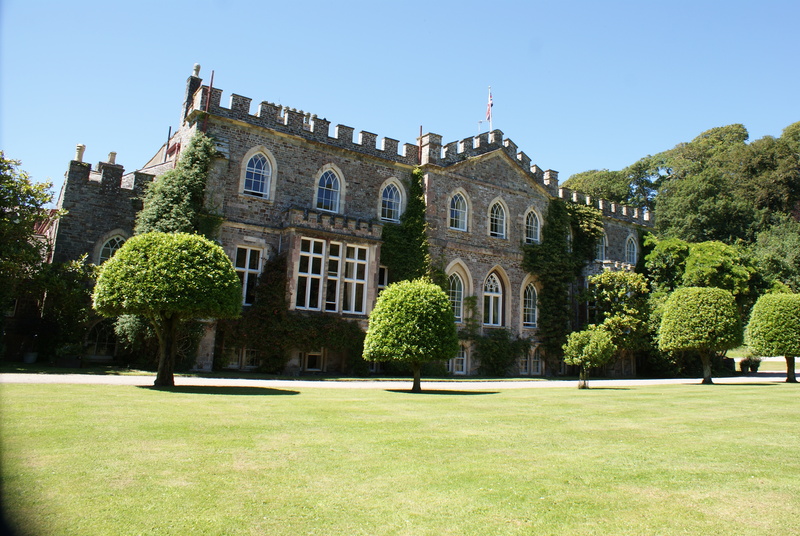 Abbey as the venue for their employees and families day out. It was a great honour to be chosen and we were very fortunate to have wonderful weather for the thousand people who came. 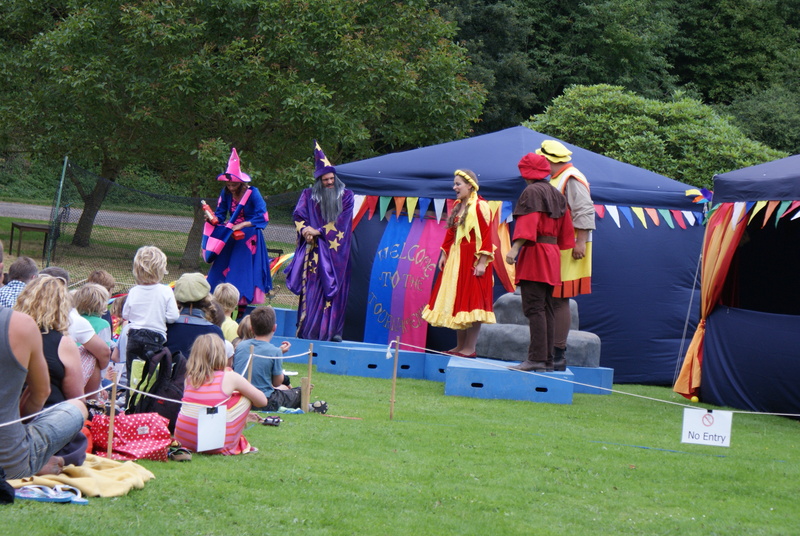 All the brilliant organisation had been done by Activis and resulted in a lot of fun for all ages. 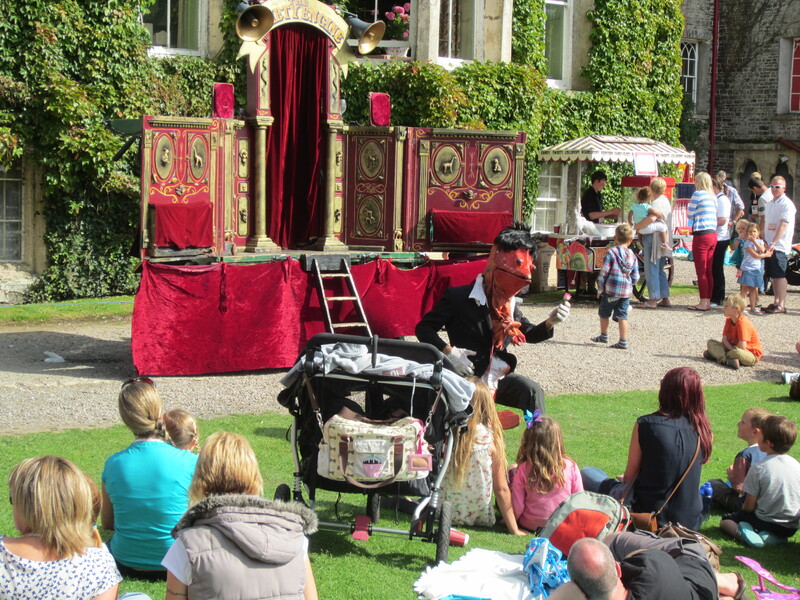 Hugely talented Victorian entertainers, Punch and Judy and acrobats were the flavour of the day along with traditional fairground rides providing a great atmosphere, very fitting to the backdrop of the Abbey. 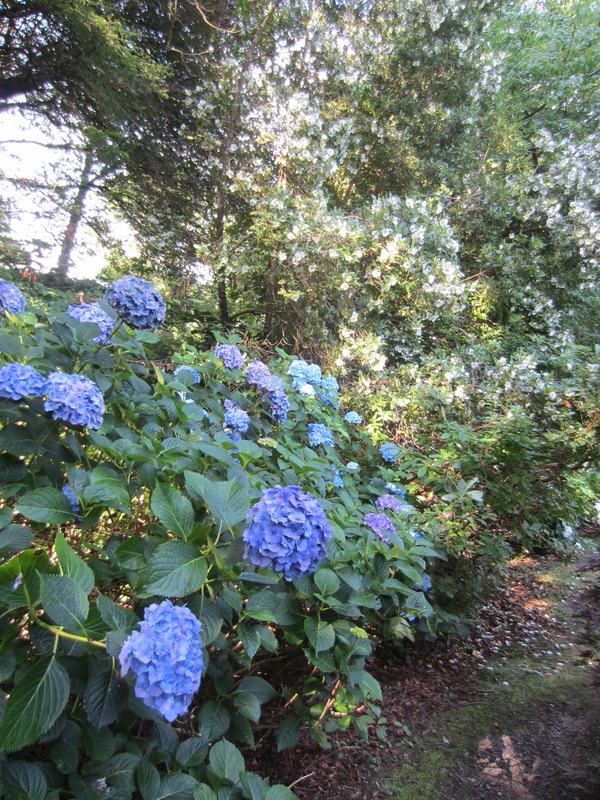 Guests were able to enjoy the walks to the beach and the gardens and many people visited the house which was open for the afternoon. It was a very happy and relaxed day out thanks to Actavis’s very efficient organisation. 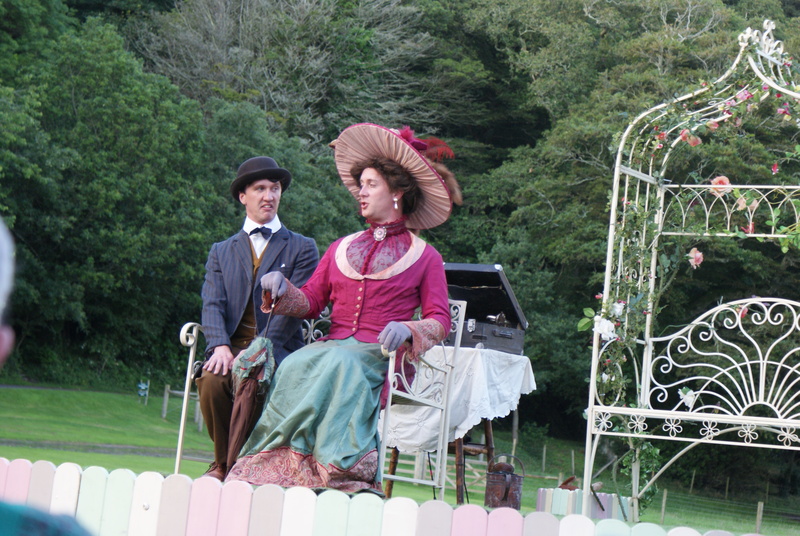 company who performed ‘The Mikado’ with us the previous week. 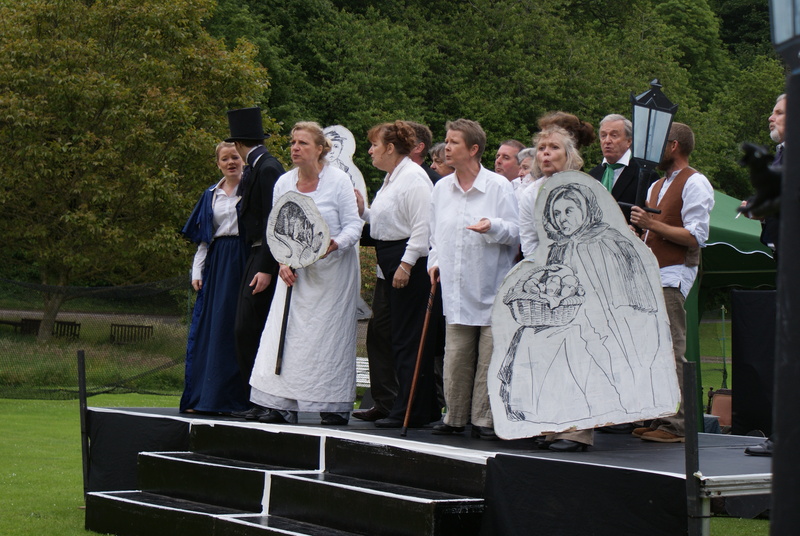 Both were fantastic productions which attracted big audiences. 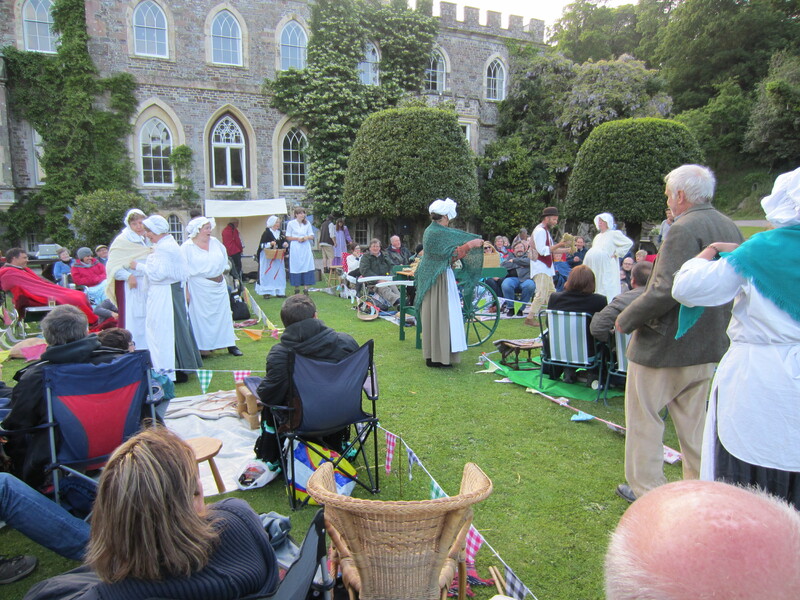 We are sad the season is over now but are so grateful to Richard Wolfenden-Brown and The Plough Arts Centre at Torrington for bringing the productions to Hartland Abbey. The bar, barbecue and children’s chocolate fountain have been very popular additions and have saved people having to bring picnics. Hopefully we will carry on the tradition next year. 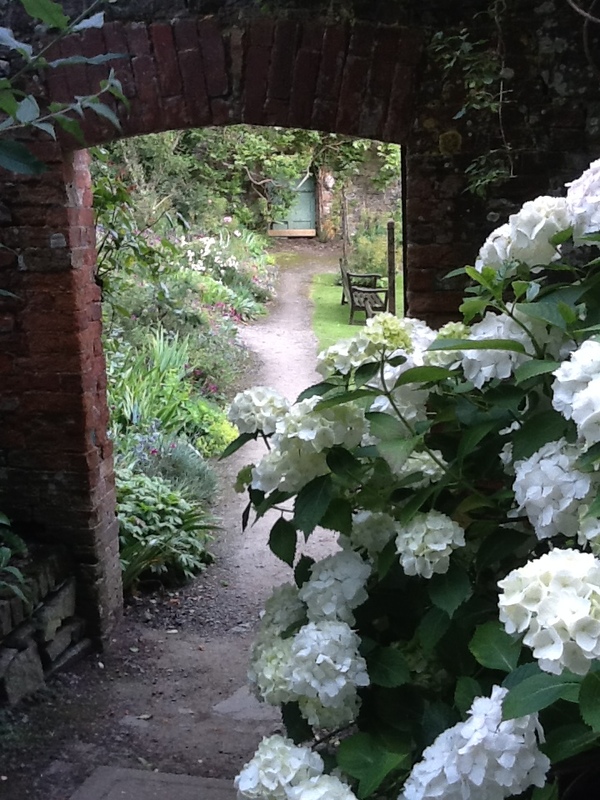 On Friday 6th September, Simon Armitage, the poet, will be stopping off for the night at Hartland Abbey on his walk round the South West Coastal Footpath. This will culminate in a new book but whilst staying the night with us he will be giving a poetry reading in the Drawing Room There are a few tickets still available at a suggested donation of £6.50 for wine and cheese in the Dining Room which kicks off at 7pm. All details from hartlandpoetry@hotmail.co.uk Ring us at the Abbey for tickets. 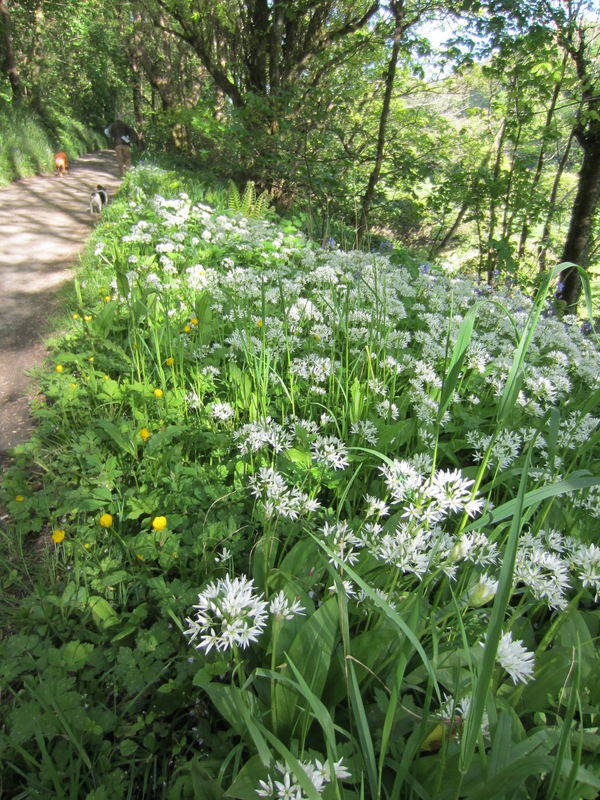 All this has been arranged by the indefatigable Alison Heimann at the AONB. Thanks to Alison for what promises to be a fascinating evening. Our thoughts are turning to jobs for the winter, of which there are always many. Carol is looking thrilled as I mentioned ‘doing up the loos’! ‘Not before time’ came the reply but we all know here that our wish list is very long and normally there is a drama like the roof leaking and then all has to go on the back burner again! 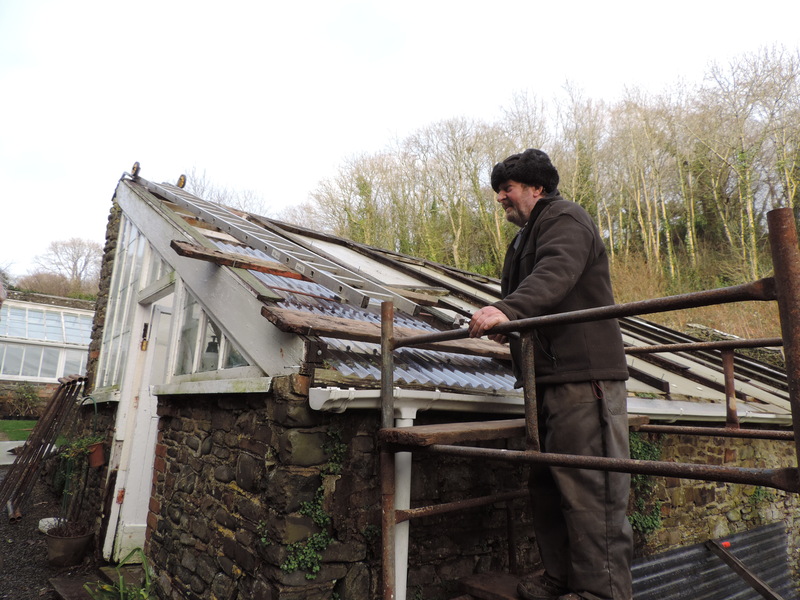 As Leighton is the only person capable of ‘doing up the loos’ we just have to hope that the roof doesn’t leak, Blackpool Mill and The Bear stay in one piece and that the hundred and one other jobs can be put on hold. THEN we can have posh loos like the National Trust! Mind you that is the only thing we want like The NT, everything else they do is stereotypical NT and we are not at all stereotypical anything here! Finally a huge thank you to all the wonderful people who have visited us this summer and written some really kind and touching remarks in our comments book. It is hugely appreciated as everyone who helps us in every way here gives their all. We have entered two competitions in North Devon, for Best Visitor Attraction www.northdevon.com/daysout for Best Tea Room www.northdevon.com/vote so if anyone feels like supporting us, we would be hugely grateful. Kath and Jo have worked so hard in their first year in the Tea Room and they have had some amazing compliments on their scrumptious food! Theresa, our new Administrator, has worked tirelessly to give everyone who visits the best possible time here, ferrying lots of less able people to the gardens and generally going far beyond the call of duty. She is marvellous. We are very lucky. Thank you Theresa! Last but not least, this afternoon we had a lovely surprise. One of our old ‘boys’ from Highgate Junior School, who were here in the war, just walked in, having taken four trains and nearly as many buses to get here from Norfolk. Not bad for a sprightly mid-octogenarian! 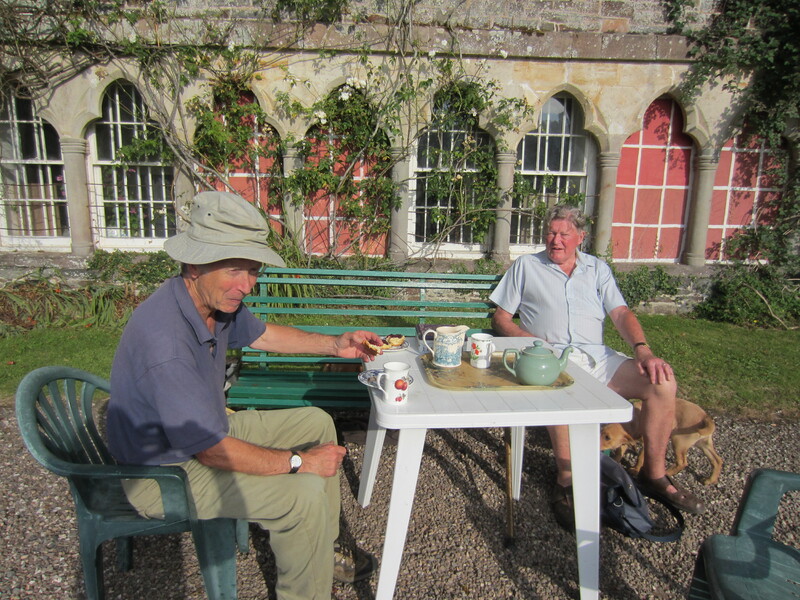 It was lovely to see Roger Kettle and we all had a lovely cup of tea in the evening sun. We miss our Highgate Reunions so much but please, if any of you read this, do be in touch. We have so many happy memories. winter and spring have conspired to hold everything back and then to put on this amazing show. 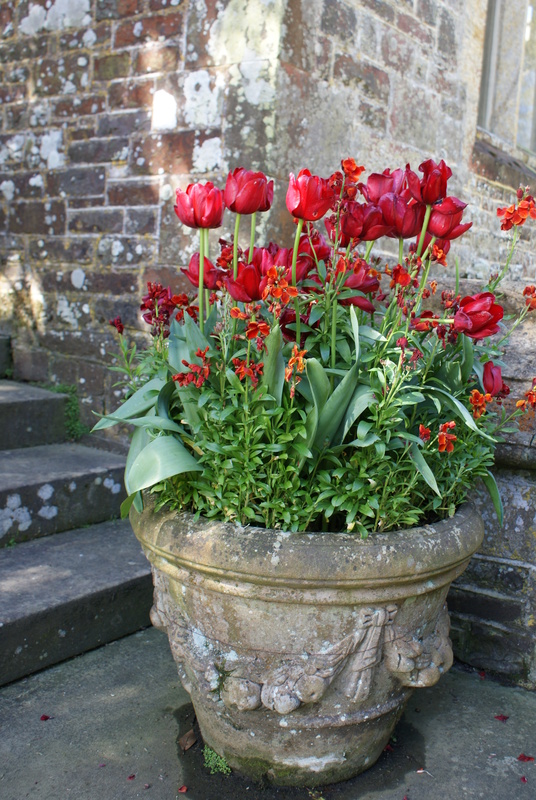 The walled gardens are looking stunning with the Red Shine tulips doing just what they say, shining against the clear blue sky. It is so peaceful in the gardens here, the silence only broken by the two peacocks shrieking across the valley to their wives who, they do not realise, have succumbed to the fox. It is so sad. They are desperate for some new wives. Instead, they are displaying their full plumage to the guinea fowl who look very confused. in all the walks, just on time for the holiday weekend. How the visitors have deserved this fine weather; for once they have been rewarded! People are enjoying the beach without winter coats and I have even seen some shorts for the first time (except our dear postman who wears them all year)! that day! The exhibition will be a muddle of everything he did from his memoirs of his friend, Isaac Newton, his drawings and records of Stonehenge and Avebury, his Itinerarium Curiosum around Britain along with his description and pictures of dissecting an elephant with Sir Hans Sloane in his garden in 1720. There will be lots to see…! congratulations to our six Hartland runners (sadly Lisa is not in the photograph), one of whom was fifth overall which really was terrific. Congratulations to Ross and to all of them! It reminded me of the London marathon a few weeks before. Our daughter ran in it for the first time, in aid of the Children’s Hospice SW, with her knee breaking down at 15 miles and walking the last 11 miles at a limp. Whatever the agony, determination overcomes it when you are raising money for children with terminal illnesses. Saturday 4th This must be the first day of a long-awaited spring. There is some warmth in the sun and lovely, almost Alpine air, and the birds all sound so much happier. Our pheasant friend, who wakes us every morning at about 5am ‘chooking’ under our bedroom window demanding his breakfast, is all puffed up and happy. 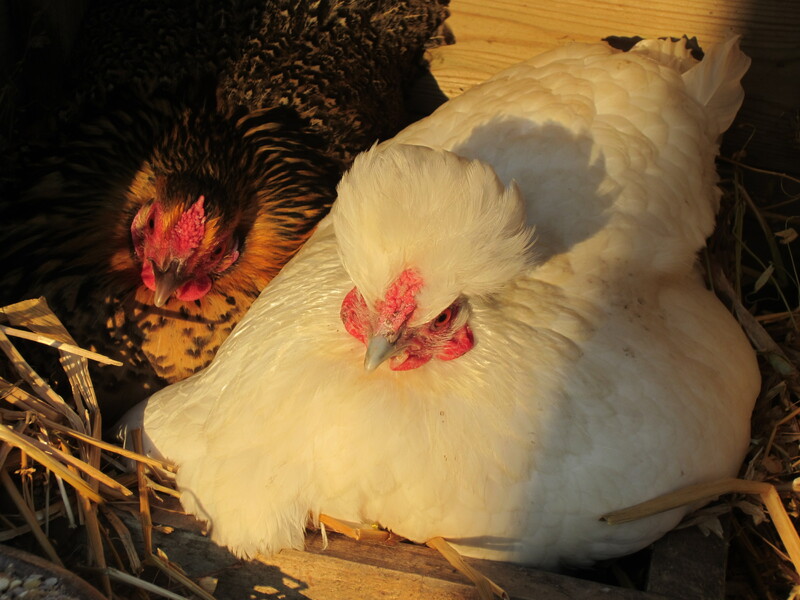 Two banty hens who hatched out only two chicks each in the freezing cold are much jollier today but keep muddling up their chicks, creating a hiatus! They have all had a lucky escape as a badger chewed through the electric wire and dug under the chicken wire surrounding the henhouse last night but mercifully never got in. They are such brutal killers and to find chickens still alive in the morning with their legs and bottoms eaten off, is one of the most distressing and cruel sights you could see. Not many people understand the devastation they cause. Hoping for this sight soon! 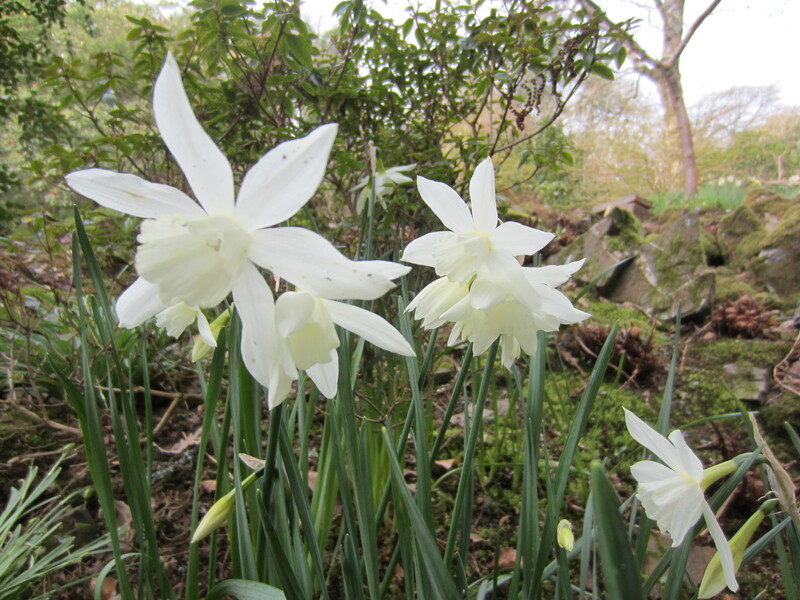 The early daffodils are still looking wonderful with the later ones still to flower! Nothing much has changed since Daffodil Day on 17th March. The first bluebells in the valley are appearing which bodes well for our Bluebell Days on 21st and 28th April. 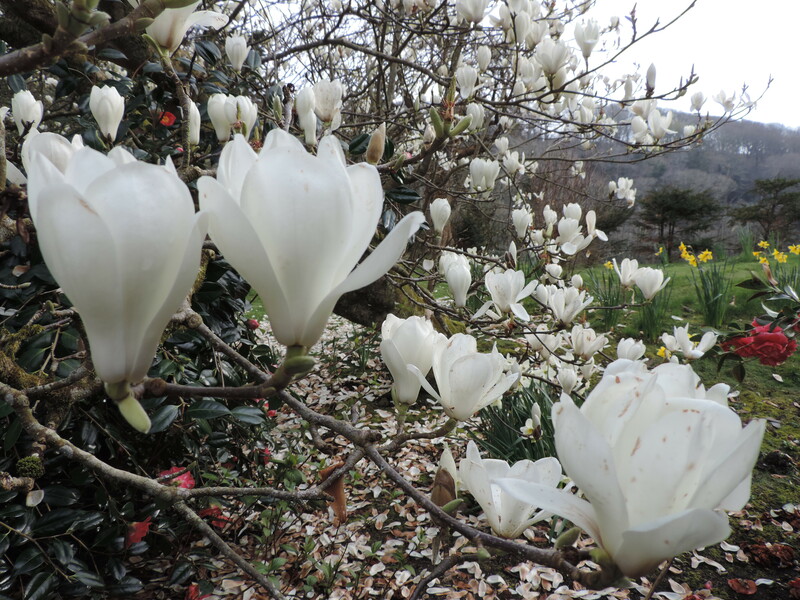 There will be lots of other lovely spring flowers out and the tulips are about to burst into bloom along with the camellias so if the bluebells are a bit late there will be plenty else to see! 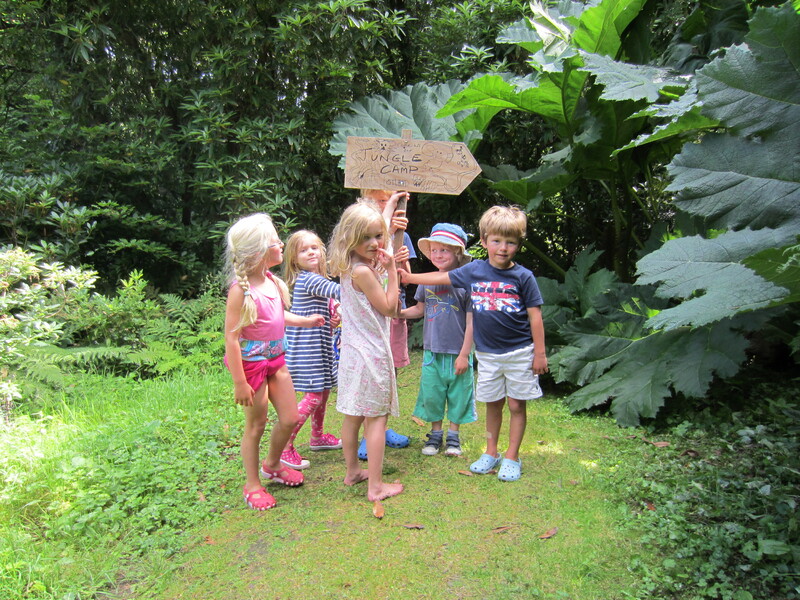 Entry to the walks and gardens on these days will be only £4 per adult with children free. 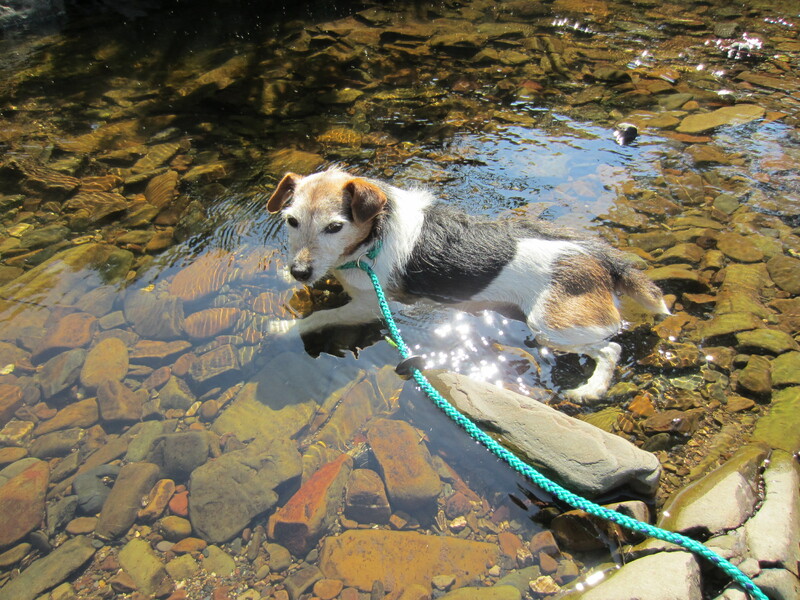 It is always a popular time for local people and dogs to visit and often there are holiday visitors as well. Our new Tea Room is proving very popular; Kath and Jo are producing mouthwateringly delicious food and lots of hot sustenance in the cold weather. They have decorated the tearoom to look so fresh and welcoming and have worked so hard. It makes us want to help them as much as we can so this week I am taking the plunge and ordering a cappuccino machine as so many of our visitors like to have different coffees. Kath and Jo have been collecting vintage china so people have the choice of modern fresh white cups or a lovely mixture of pretty ones to suit all tastes! Preparations for the opening of our William Stukeley Exhibition are coming on albeit a bit later than we had wished but hopefully not as late as the opening of the Rijksmuseum in Amsterdam which has reopened five years late! We plan to open in May. Finding and ordering all the images, obtaining permission from the Bodleian, Corpus Christi etc, researching manuscripts and books, designing the display, making and painting exhibition cases – all such a big learning curve. David Northmore , Sir H’s cousin and an Emeritus Professor of Science in America in real life, has produced some really clever, eccentric and exciting design, quite unlike anything I have ever seen! An academic, he has surprised us all (and probably himself) by his creativity. Philip Johns, in Hartland, has made some stunning scale models of Stonehenge and Avebury for us; we are so grateful to him as he is not very well. We wish him a full recovery. We are now so obsessed with our ancestor that I doubt we will ever end our research, it is so extraordinary! 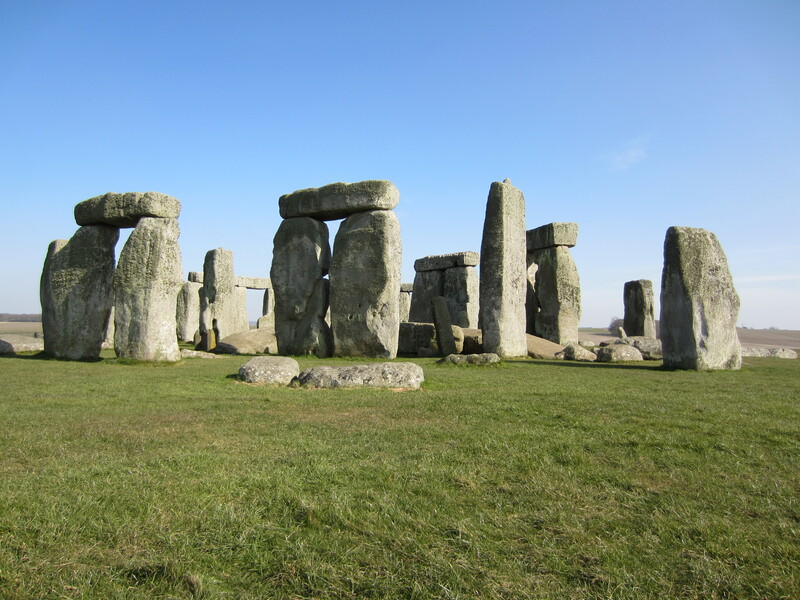 Reading Stukeley’s 1745 books on Stonehenge and Abury (Avebury) and Stuart Piggott’s Biography has become my night-time reading which I shall miss, especially when WS is becoming obsessed by Druids having been perfectly normal in the 1720s! Our son in law, Tom Scudamore, had a good winner at Aintree on Friday on a lovely horse called Dynaste for the David Pipe team. He had a great Grand National ride on Major Malarkey for Nigel Twiston-Davies; he was never going to worry the judge but his bright yellow colours were easy to see nearer the back than the front and he had a wonderful ride on a true stayer finishing 11th. What a wonderful Grand National it was on a beautiful spring day with the horses loving that good going. Charlotte, his wife, is running in the London Marathon next week in aid of the Children’s Hospice, South West. It is a brilliant cause and she has raised a great sum to help them in their wonderful work. Blackpool Mill has had a facelift with Mel tongue and grooving the kitchen and the shower. Please don’t worry, (all our regular guests), it is only to stop the paint flaking off the wall! Nothing has really changed! (our guests hate change)! It has made it so much cosier and warmer. We have had a lovely Easter with nearly all the family. The Abbey was like living in a deep freeze and my mother, who is 91, braved it admirably! Good wartime training! We had lots of visitors who also braved the icy blast and children had a lovely time doing our Treasure Hunt with an Easter egg for each participant. We have some lovely coach groups this week and John Hodges, our head steward, and I did a double act today – he providing all the Abbey history and me filling in with all the family anecdotes. Topically, we were reminiscing on the visit of Sir Dennis and Lady Thatcher to the Abbey in 2002. It was an enormous honour for us. They were so interested in the house and Lady T was especially fascinated by our Falklands display, of the photographs and diary entries of Sir H’s grandfather when he made a visit to the Falklands in 1909 with his dog, Madge! His diary had been published in the Economist at the time of the Falklands war in 1982; it contains many drawings and early photographs from 1909 of the country and buildings which were the same then as in 1982, very little had changed in nearly 80 years. We have many happy memories of that special day. I well remember when our children were small, we were in the grip of strikes and I had to heat their food and bottles on the open fire as there was no electricity or heating. Then Mrs. T was elected and we had her to thank for restoring essential services to our life and we were only too pleased to repay her in some small way. The black sheep have arrived back at the Abbey today from the farm. Graham and Trevor, our farmhands, drive them down the link road in two trailers behind their tractors causing awful queues, I am sure! If only the link road had been a dual carriageway originally, this would never happen. It seems so unfair that South Devon has such a good road and we are stuck with a very inferior link to the outside world. The sheep, and their lambs, looked as though they had arrived in heaven with so much grass in the park. Now the donkeys and sheep create a lovely pastoral scene for our visitors. The sheep can’t lamb here as the foxes and badgers will eat the lambs when they are born. Hopefully they are old enough to escape now. Black Welsh Mountain lambs are so sweet with their long tails. Becky and her baby, Snowdrop are proving very popular with visitors; they love all the attention! We were very sad that we had to cancel Snowdrop Weekend but we decided soon after Christmas that the waterlogged ground would not dry out in time for cars to park on it. Luckily we were entirely vindicated as the ground is still completely saturated and everyone would have been stuck in the car park. Lets hope 2014 will be kinder to us and Snowdrop Days will return. Since Christmas everyone has been flat out with our exciting new projects at the Abbey. The new kitchen and Tea Room are beginning to look really good for the start of the season. Jo and Kath, both local Hartland girls, have taken on the lease of the Tea Room from the church ladies who retired in 2012 after 26 years! 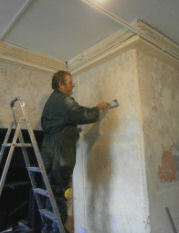 After stripping off centuries of paint, Leighton has repainted the walls and the room now looks really fresh. Kath and Jo have brought some very pretty tablecloth material, the new china has arrived, Lofty has attached a new electricity supply and soon masses of delicious food and drink will be provided for our visitors. The big question now is what sort of coffee machine to have…! Carol has been having a major springclean all winter. We hired the carpet cleaning machine to do the red carpet in the Alhambra passage; it was horrifying to see how filthy the water was but hardly surprising after many thousands of people had walked round the house last summer. Thanks to our fashionable blue overshoes it wasn’t worse! Apologies to those who don’t like wearing them but please think of Carol and what it would be like in your own home if 14,000 people walked round it, straight from the garden! The garden wall is not looking good! very high and Nigel will produce a wonderful display come the spring. We are so lucky to have such a fantastic team. 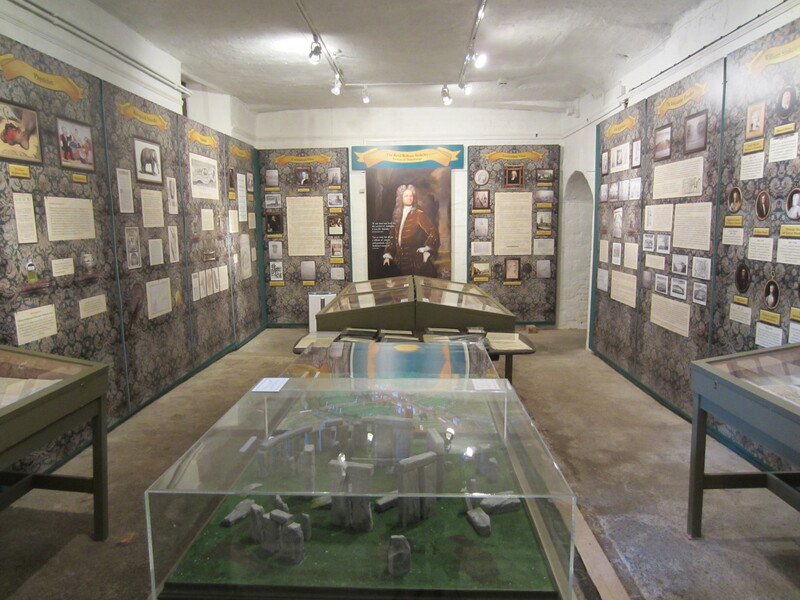 Our next big project is staging the ‘William Stukeley – Saviour of Stonehenge’ exhibition; again poor old Leighton has been hard at work lining the walls in the ‘dungeon’ to make a good display space. When we decided to stage this I deluded myself into thinking it would be easy. Having got to know William Stukeley a lot better I realise how wrong I was. 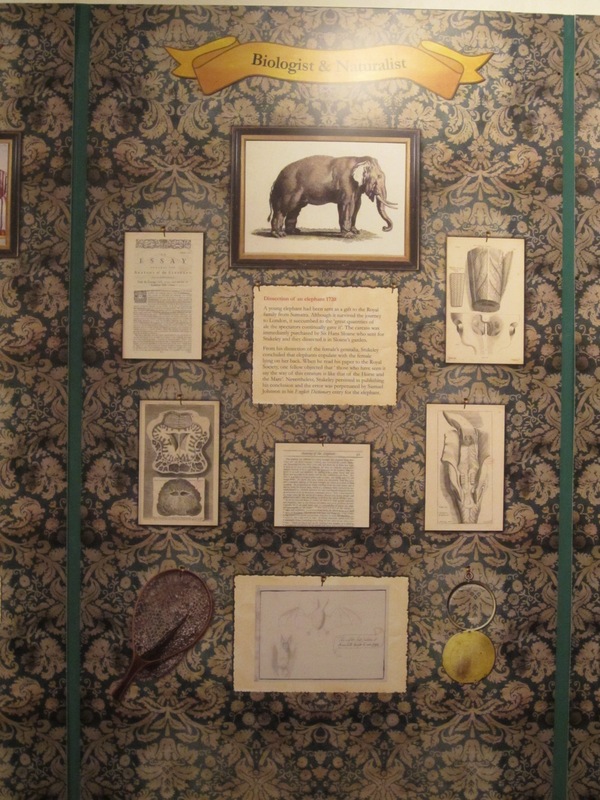 Trying to sort out what to display is the difficult bit; he is such an intriguing subject, friend of Sir Isaac Newton,a polymath into everything imaginable from saving Stonehenge and Avebury to dissecting a dead elephant in the centre of London with Sir Hans Sloane in 1720. My husband’s cousin who is a professor in America is being a wonderful help and support. David has created a fantastic, very original design for the display so it is all becoming a reality. We have to go to the Bodleian soon to get some images. Hopefully we will be able to open in May. 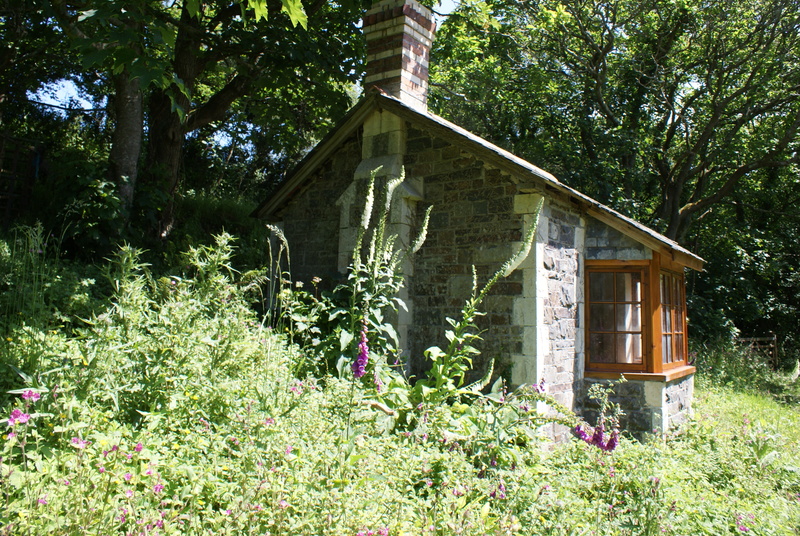 is a really cosy cottage for a holiday. We are putting in lots more tongue and groove at Blackpool Mill as the walls are always crumbling, they are so old. Poor Leighton never stops painting them. The t and g should make it much warmer too and use less oil. 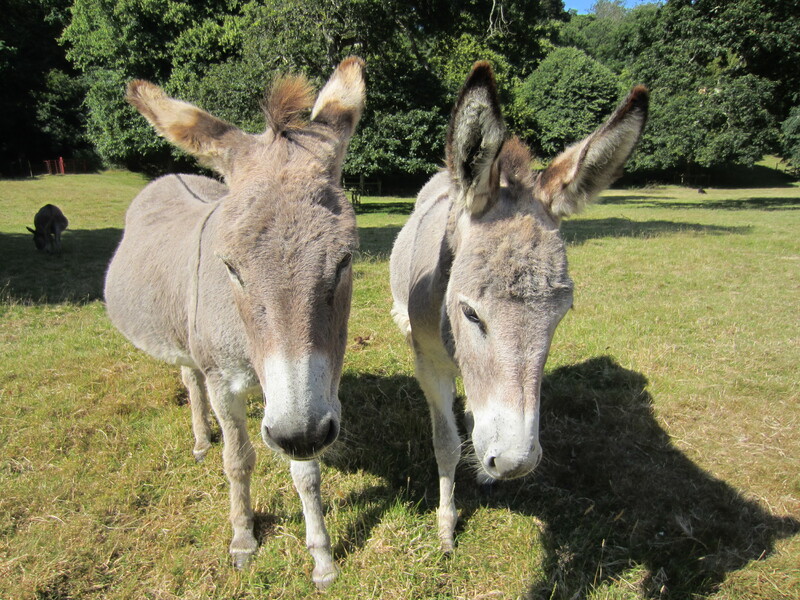 nicest mother and daughter donkeys, Becky and Snowdrop II (as she arrived at snowdrop time! 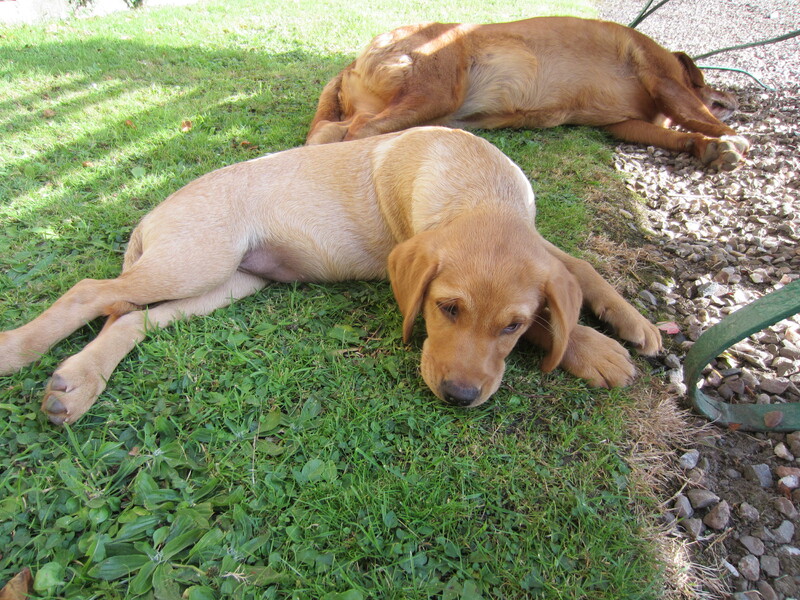 ), from nearby who have settled in really well already and will soon be meeting our visitors when we open. 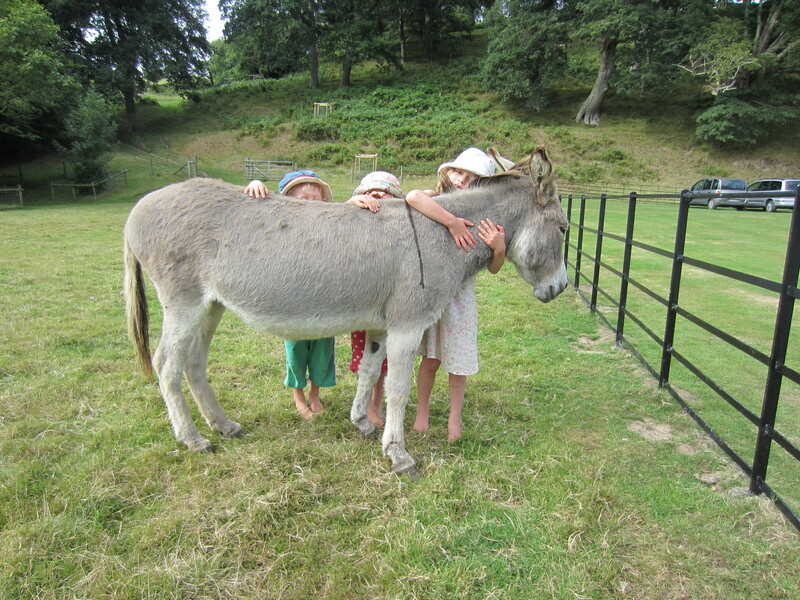 It will be lovely for all the visiting children to have a baby donkey to pat. We are still terribly sad to lose Bluebell as she was 37 and very much part of the family. 24th March. 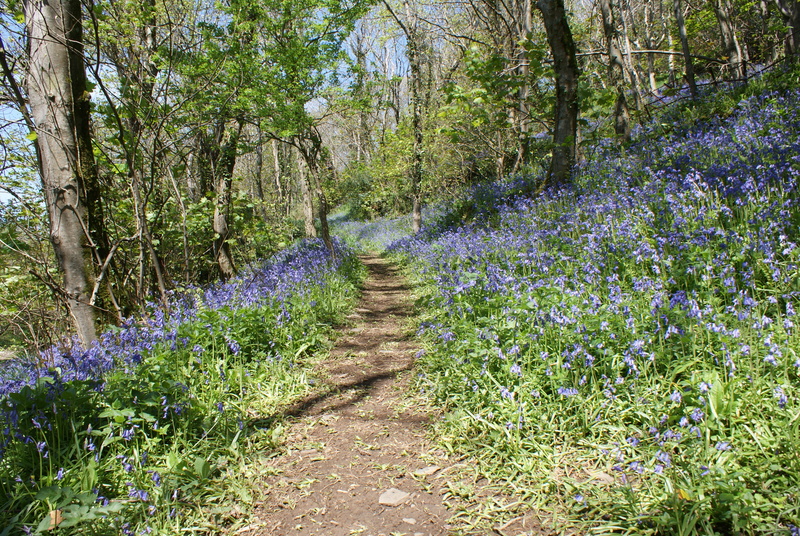 Bluebell Days on 21st and 28th April. 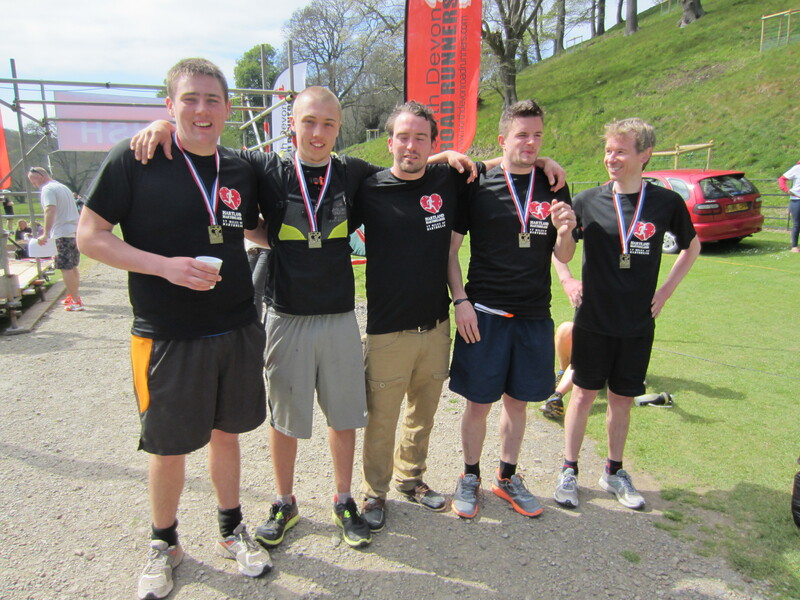 The Hartland Hartbreaker Charity Run on 5th May – it sounds awful – 17 miles of sheer hell but in aid of a wonderful cause, The Children’s Hospice and our own Parish Hall as well. So much to do before then. …Theresa has done some wonderful new interpretation notices for our displays so everything will look so much better in 2013. 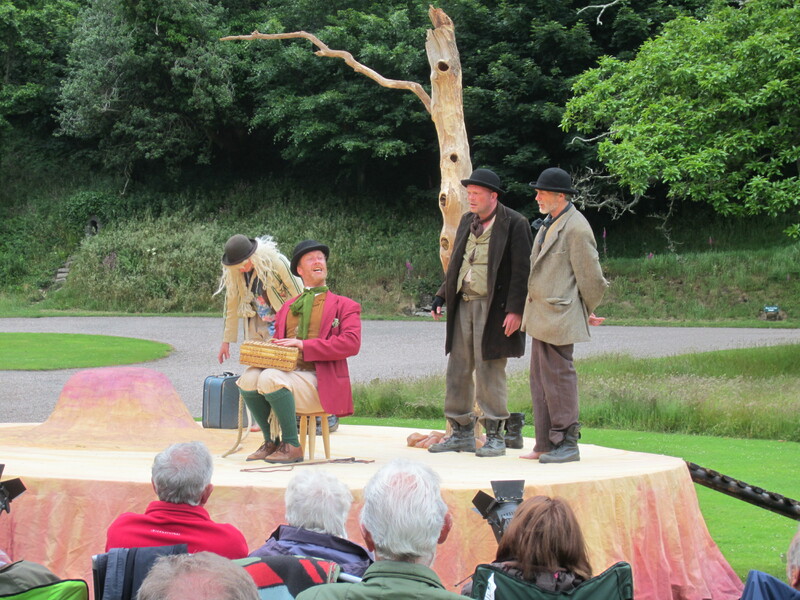 We have lots of exciting theatre productions coming up in the summer. So it is all go down at the Abbey in 2013…. Martin Dorey – The Campervan Man! Martin Dorey, the Campervan Man, is putting on some exciting Campervan holidays here, by the river. Here he is on his last visit to Hartland when he was making a film in 2010. Martin is great fun and his holidays will be fantastic . 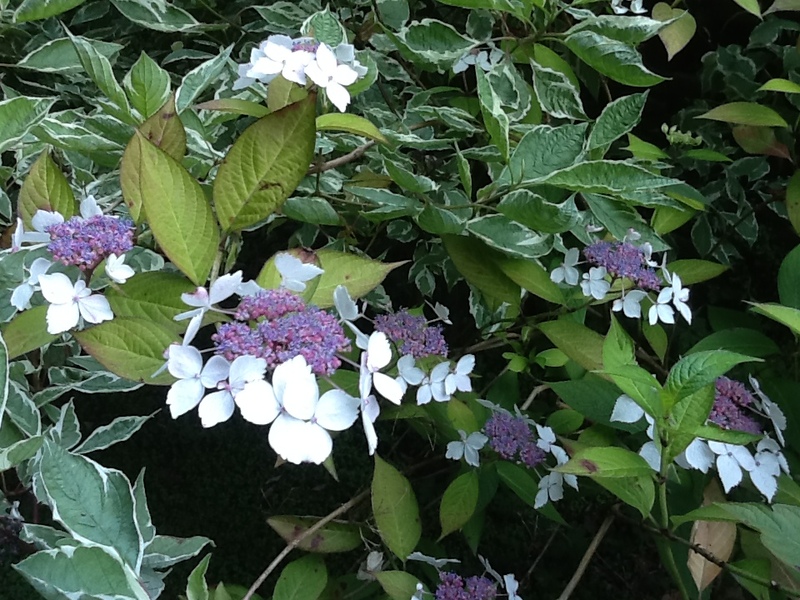 This week I mustn’t forget to design our new leaflet, check proofs for our advertising, order the seeds, order all the new catering equipment for Kath and Jo, start deadheading at least 200 hydrangeas, help Alice write her blog, go to the Bodleian to research the exhibition and so it goes on! ‘Apparently’, according to the children, it keeps us young! We will see. It is already mid-November and Christmas is approaching rapidly over the horizon. With our four children, their other halves, nine grandchildren, my mother and other friends staying and another influx on Boxing Day, now is the time I have to start cooking. With so many presents to buy and wrap up and masses of food to prepare I try to get organised early on so that I can actually enjoy Christmas! There is always the risk of getting flu just at the worst time as everyone is arriving; even a flu injection doesn’t seem to do the job properly! We buy our turkey from a near neighbour who produces the most delicious turkeys who have lived a very happy life. I normally provide good post-Christmas business to our local chiropractor, Frank Loftus, in South Molton as heaving a turkey which feeds 20 people in and out of the Aga normally does my back in! But it is a wonderful time all together with all the children and their children and ninety year old great-granny! 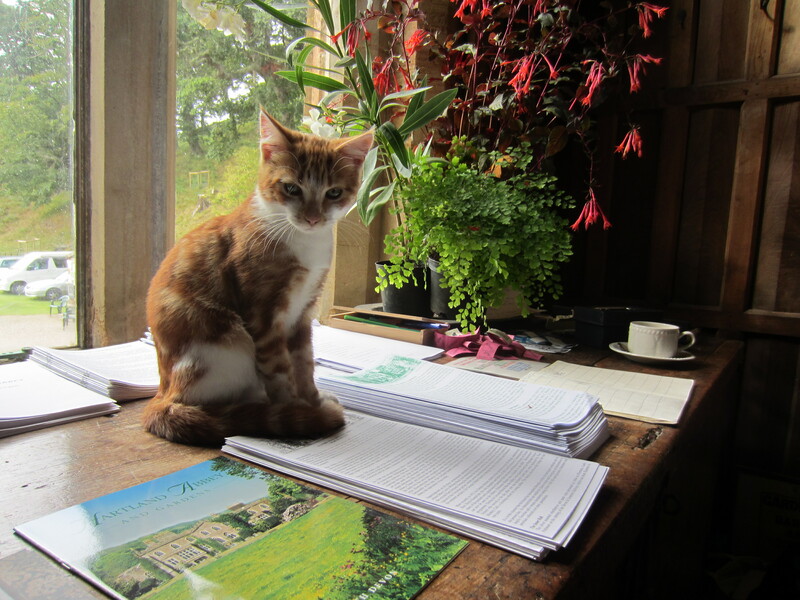 This autumn has been particularly busy for us at the Abbey with exciting things happening for next season. At the end of September we said goodbye sadly to Nancy Johns and all the wonderful ladies from St Nectan’s Church who had run the Abbey Tea Rooms for the past 26 years. Anno domini was catching up and there were just not enough younger volunteers to take it on. We also said goodbye to Mary Heard who had been our Administrator for nearly as long and has been such a support to us over that time. Just before we closed we held a lunch in aid of Elizabeth Finn which does such great work to help elderly people. Mark Poltimore, who is a cousin of my husband, came down to Hartland and gave a very amusing talk about being an expert on the Antiques Roadshow. He brought lots of slides and kept the audience enthralled with ‘behind the scenes’ stories. The Elizabeth Finn committee then gave everyone the most fantastic buffet lunch in the Dining Room, all cooked by themselves. Every cloud has a silver lining as they say and out of the ether has appeared Kath Morrison and Jo Wade to take over the running of the cafe in the Old Kitchens. Kath has been helping us in the kiosk, welcoming visitors and stewarding in the past and has a history of catering. Her friend Jo has a shop in Bideford currently but will be starting a new career feeding all our visitors! It promises to carry on with the same ethos of good home baking with all the familiar homemade scones and cakes but will have exciting new additions like hot paninis and cappucino coffee from the coffee machine! We are moving forward…! Leighton, our wonderful handyman for the past umpteen years, is busily redecorating the Tea Rooms and soon a new kitchen will be installed with ovens and all mod cons ready for its launch on Snowdrop Weekend! Theresa Seligmann has taken over Mary’s job as Administrator and is attacking the job with huge enthusiasm and energy! She has lots of ideas to make everyone’s visit more exciting. We have started by revamping our website with the help of Stephen Hobbs our honourary archivist who is so good at all the technical stuff. We have still got a bit of tweaking to do until we are really happy with it but it is such an improvement on the last one. It should make it easier for potential visitors to see what we do. 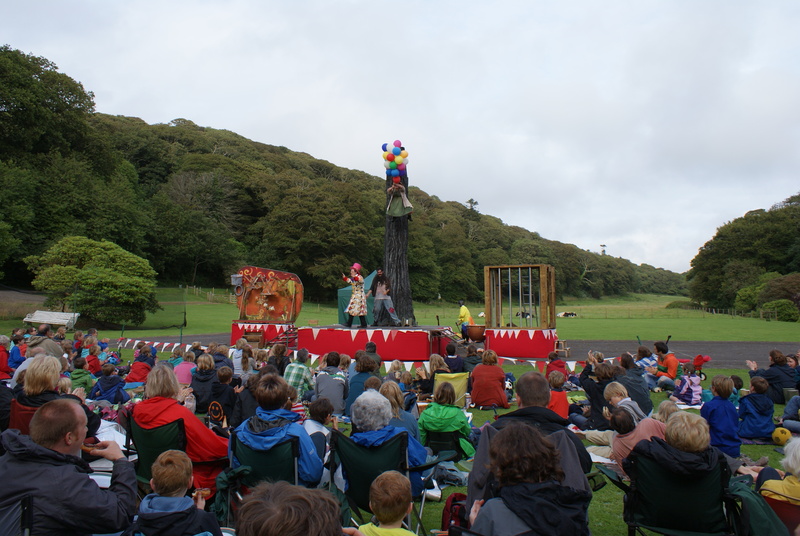 We have so many exciting events for 2013 and we will keep posting the details when we have them. Our opening times for 2013 will be completely different from previous years; we will be open from Sunday to Thursday all season from March 24th – October 6th inclusive from 11.30 – 5pm and closed on Friday and Saturdays. We start the season with Snowdrop Weekend on 9th and 10th February. It is always such an exciting time with the thousands of snowdrops appearing from the Walled Gardens to the sea. 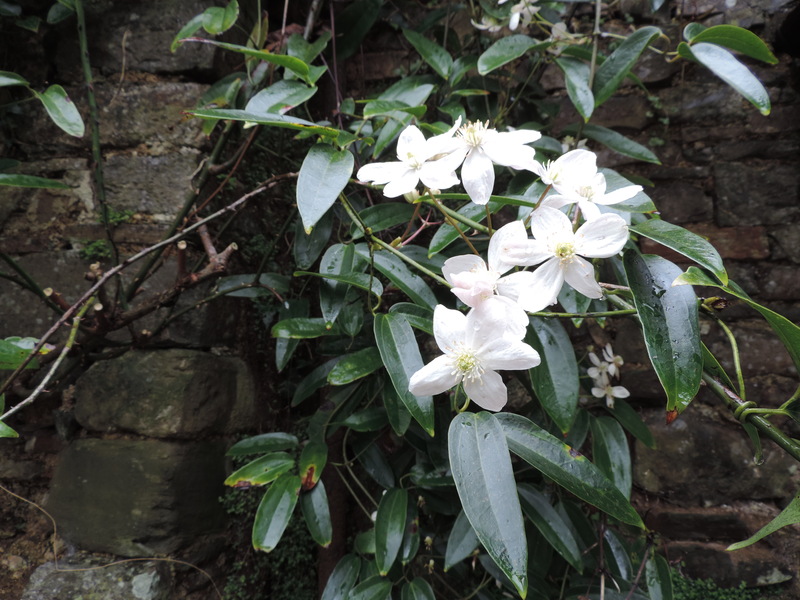 We open up other parts of the estate which are not normally open where the snowdrops grow so there is masses of room to explore and for children and dogs to run wild! We always encourage visitors to bring as many dogs as possible and the result is the most amazing array of all shapes, sizes and breeds. 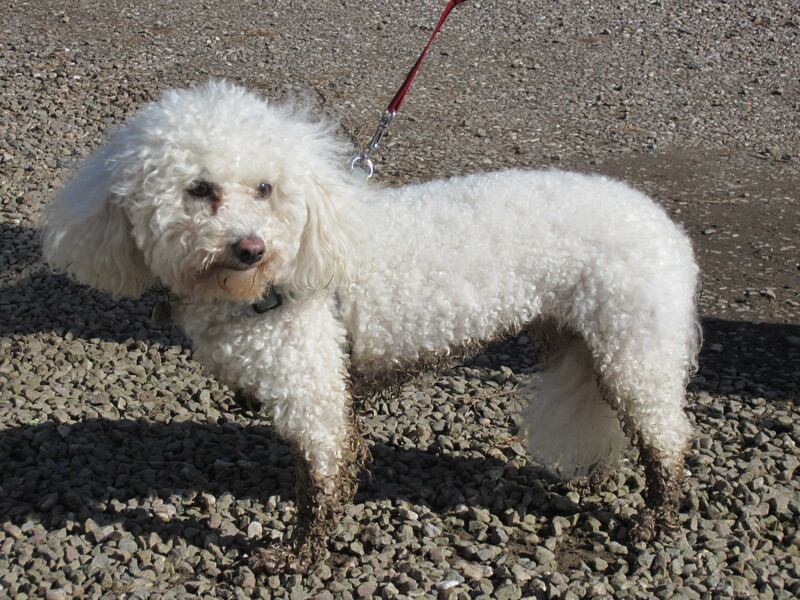 Some arrive in posh coats which are soon covered in mud as the pooches go berserk in all the space! I always mean to hold a Dog Show at the same time but people might freeze to death at that time of year! 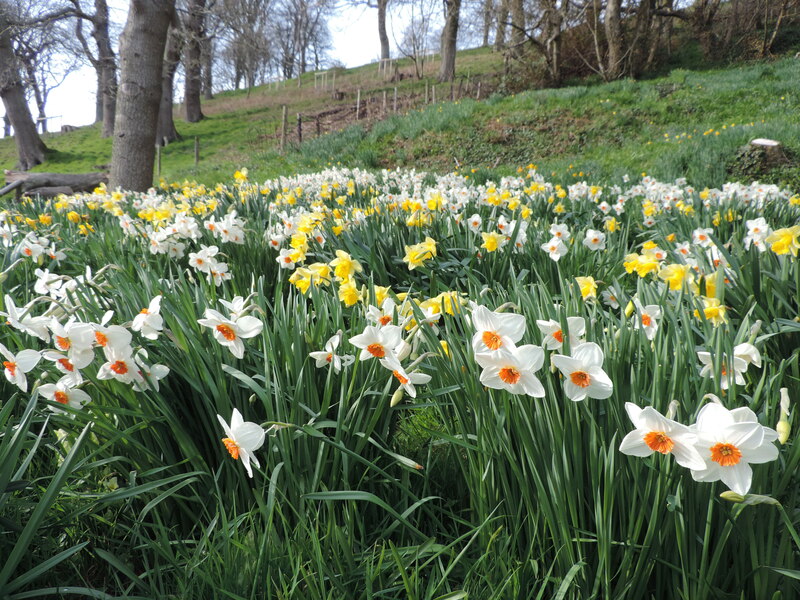 In March we have our annual Daffodil Day on Sunday 17th and then we reopen for the season on Sunday 24th March in time for Easter. 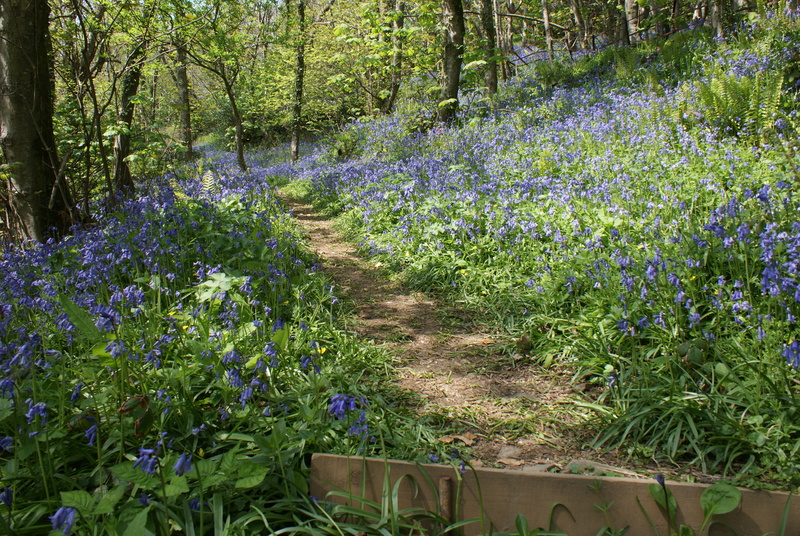 The week of April 21st – 28th we will open every day for Bluebell Week which is such a beautiful time of year and hopefully a bit warmer by then. 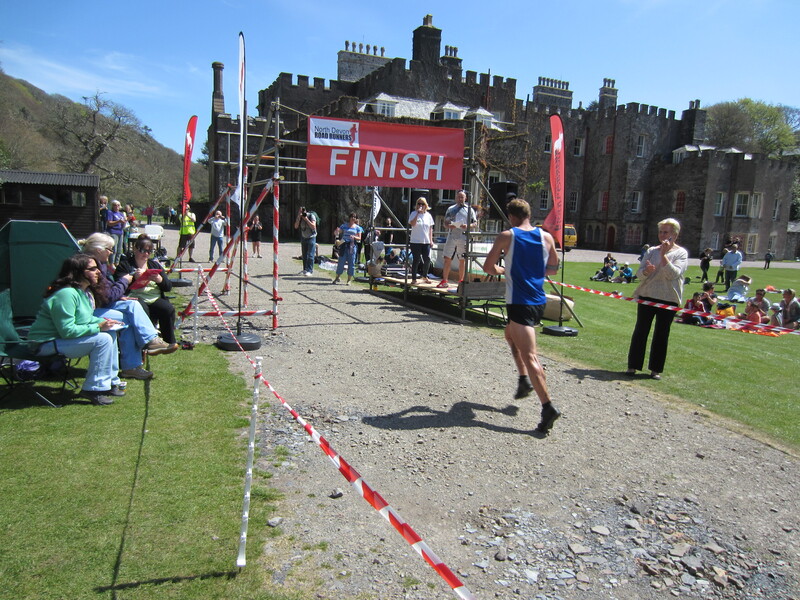 On Sunday 5th May, during the first bank holiday weekend, we hold a very exciting new event called The Hartland Hartbreaker which sounds hellish as it is a really gruelling cross-country race starting and finishing at the Abbey. Apparently it is about 15 miles long, up and down the steep coastal footpath, through the fields on the estate and through as much mud and water as possible, we are told! It is all in aid of some very good causes including the Children’s Hospice, South West. We will hope lots of people will come, not only to take part but to watch as well. More details will be posted on our website when we know what is happening. 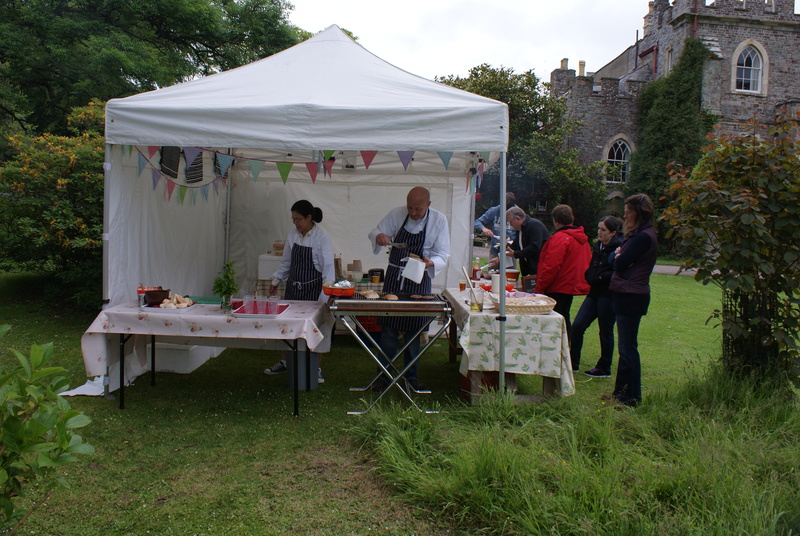 At all our events we hope to have Sam and Em Stone from Exmoor Kitchen with their delicious barbecue as well as the Tea Room producing some delicious drinks and eats and hot pasties. 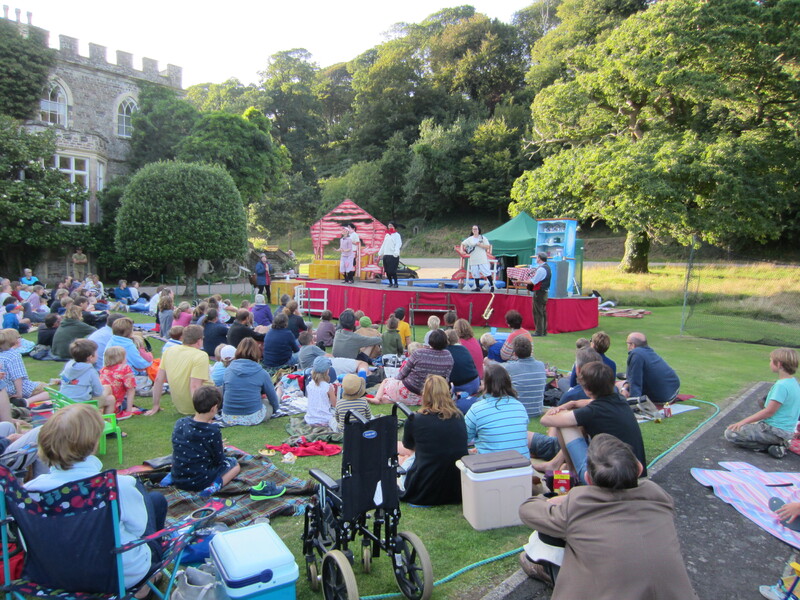 We will also be holding Outdoor Theatre events during the summer but we have not got any dates yet but I know ‘Treasure Island’ is in the offing in August. This will be very befitting to Hartland as years ago the film was made here. 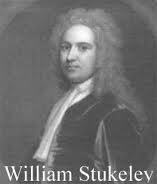 For the whole 2013 season we are planning to stage an exhibition on William Stukeley who was a friend of Sir Isaac Newton, wrote on his famous apple experience, was instrumental in saving Stonehenge and Avebury from being ground up into road building materials and is a distant ancestor of my husband. He was an amazing man who seemed to have achieved more in his life than most people would in 10 lives. We have his portrait by Kneller looking down on us every day in the Little Dining Room so it is fun researching his life which ranged from being a druid, an antiquarian, an archaeologist to a vicar! 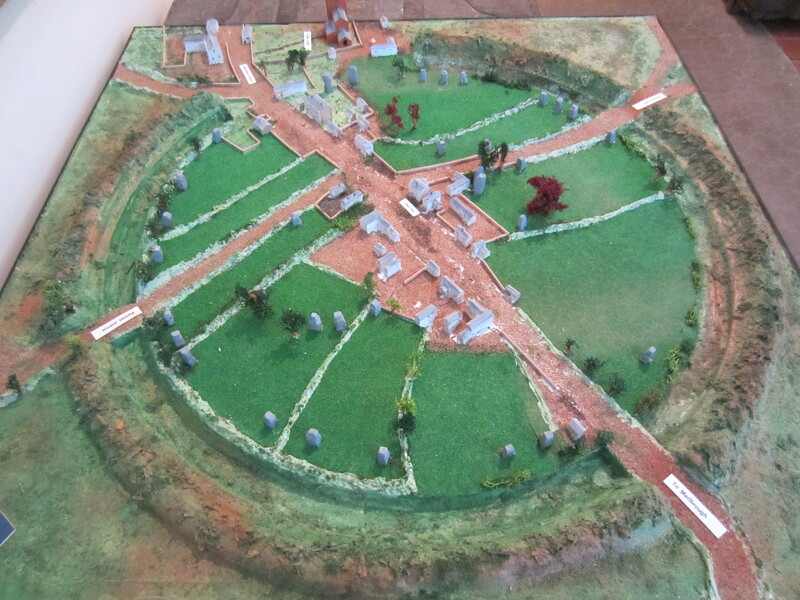 We also hope to have scale models of Stonehenge and Avebury made by a local person. I was inspired by hearing two programmes about Sir William on BBC Radio 4 recently. 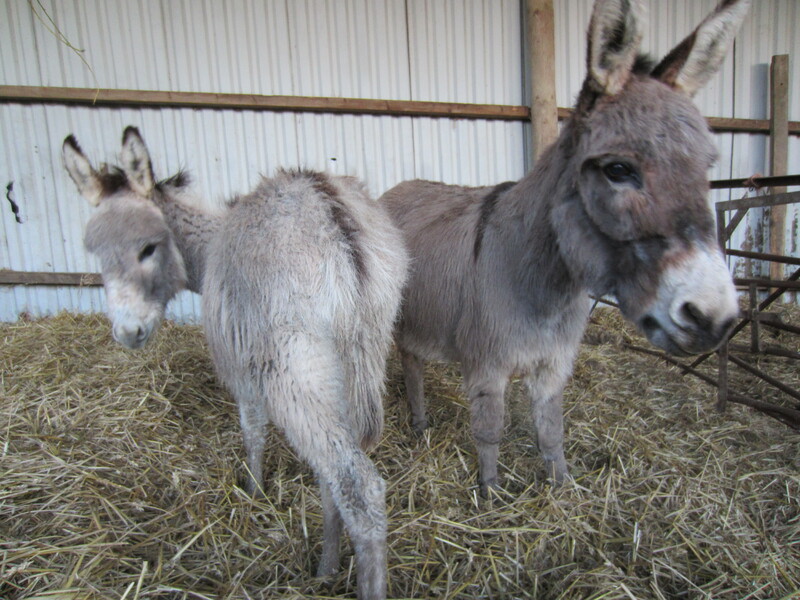 The donkeys are back at the farm in great luxury with lots to eat and plenty of shelter. Alice has taken up her winter living next to the Aga between forays to chase anything that moves. Nowadays most things escape as she has slowed down a bit! I have been wanting a cat for ages but knew that it wouldn’t survive with the dogs but I now feel much more confident as Alice is much lazier. Hopefully we will get a kitten soon as the mouse problem is awful. They seem to thrive on mouse poison and take the bait to have picnics in the beds while making holes in the blankets to make nests! It is very annoying (and expensive). We have just had a couple of days in London attending the Historic Houses Association AGM. They are the most wonderful organisation for us house owners, helping us with our problems and giving us great inspiration. Being able to discuss house opening with other people in similar circumstances is enormously helpful. Most historic houses in private ownership are members. 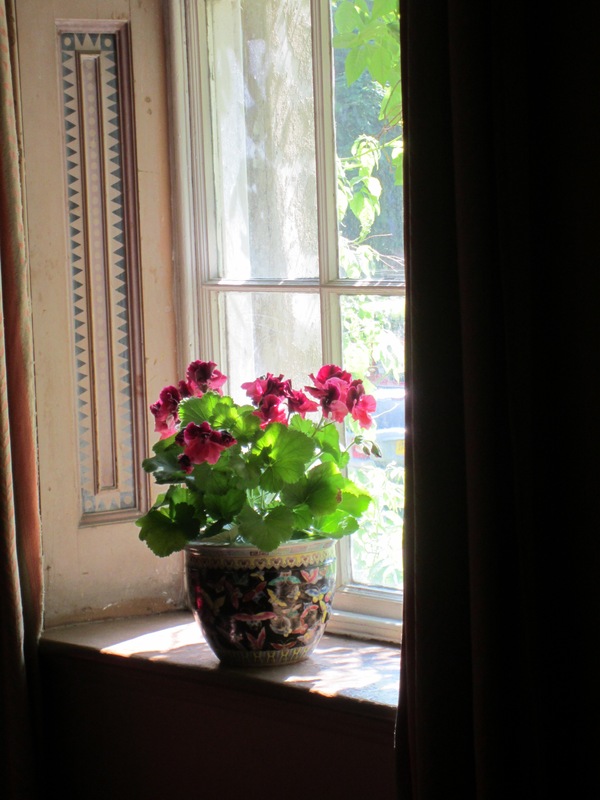 They run an excellent Friends Organisation which with an annual membership subscription allows free entry into all open HHA houses and many that are normally closed to the public. The family have had busy summers and autumns. Our eldest daughter with her husband, Tom Scudamore the jockey, moved house into an old farmhouse which they painted themselves from top to toe. They are now ensconced well in time for Christmas. Tom had a successful weekend at Cheltenham with a couple of winners and a handful of seconds. It has rained and blown so much lately that a huge chunk of the Walled Garden wall has fallen down, luckily not on top of anyone. Just what we did not want when we are so busy. 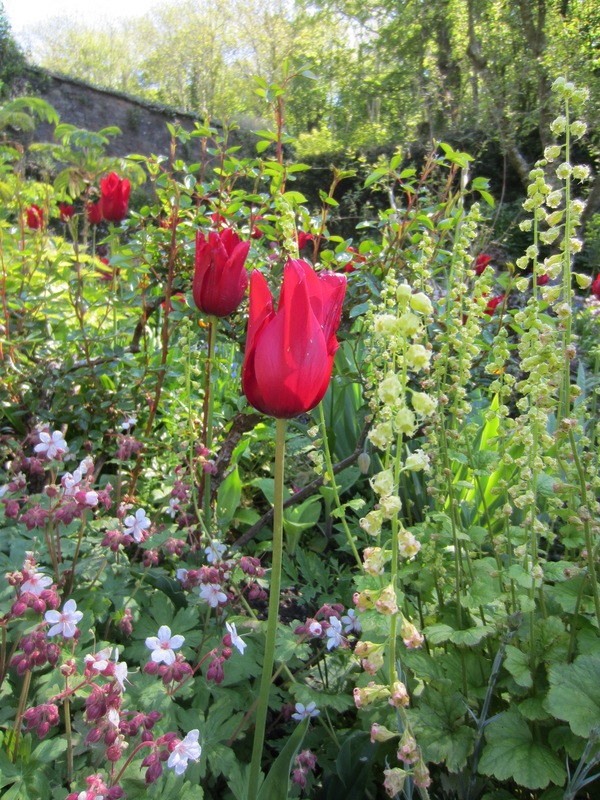 Nigel and Sam are working so hard at the moment cutting down the borders and planting all the tulips for next spring. We are going with the same colours again which we love but next year I think we will be really radical and have a complete change! 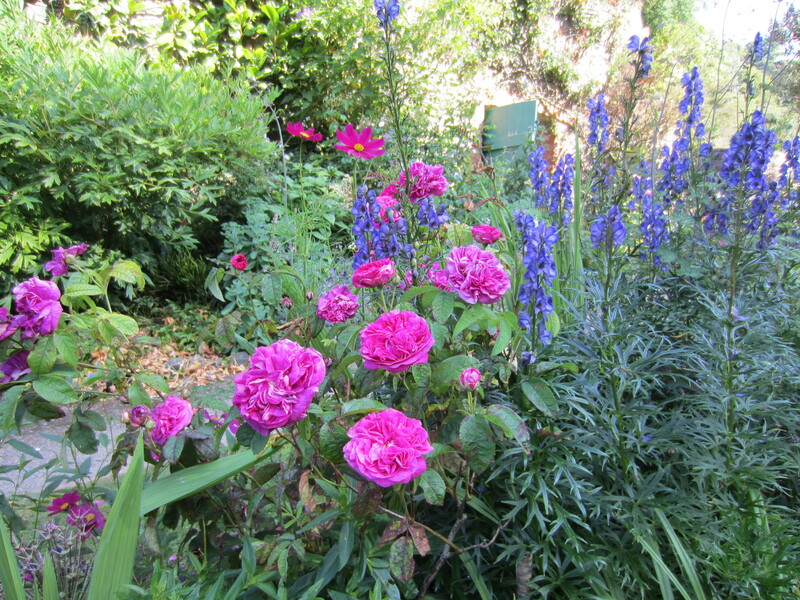 We have differing shades of purple, yellow and red in the Rose Garden which look stunning, purples in the pots and bright red in the pots by the front door. Nigel has done a wonderful job in his first season and we had many compliments particularly on his stunning displays in the summerhouse. 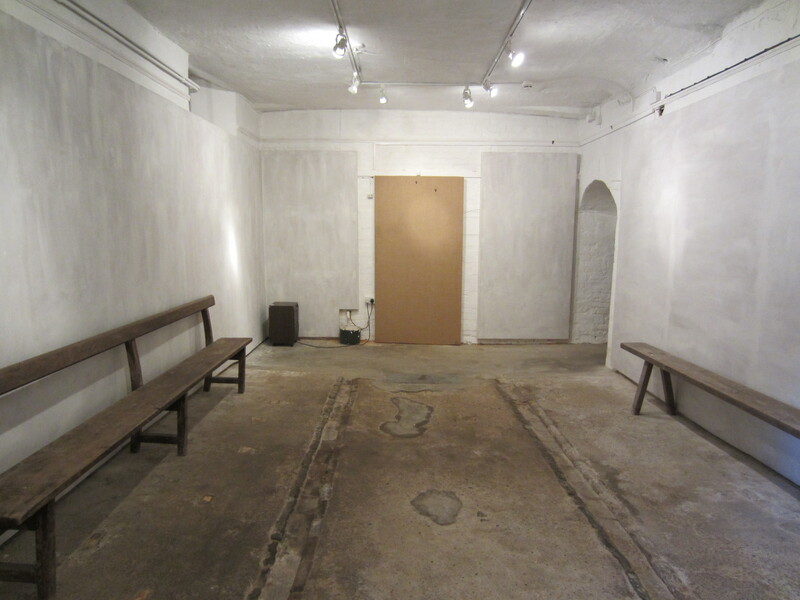 With so much to do to get the exhibition and the tea rooms ready it may be a while before the next blog! A happy Christmas and New Year to all who have visited us in the past and we hope to see you back again soon. and the inky blue of the mopheads but almost the prettiest are the white lacecaps with their beautiful blue eyes. Those of our visitors who have ventured over the Abbey river have been enjoying them enormously. 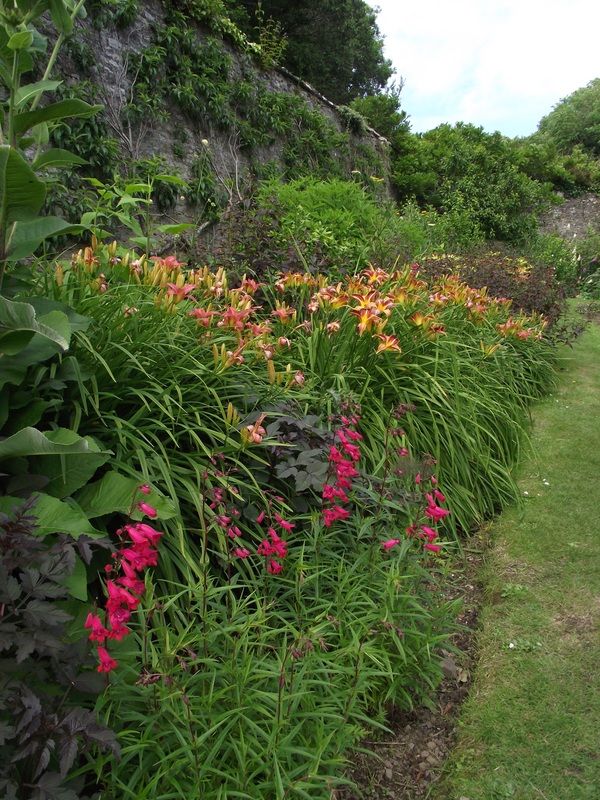 The Walled Gardens are still looking stunning with the peppery-smelling purple phloxes in full bloom and helianthemums, penstemon, japanese anenomes, fuchsias and lots of autumn flowers coming into flower. Nigel has created a wonderful, rather Victorian, display in the summerhouse which has been a lovely refuge to garden visitors who are caught in the not infrequent downpours of late. 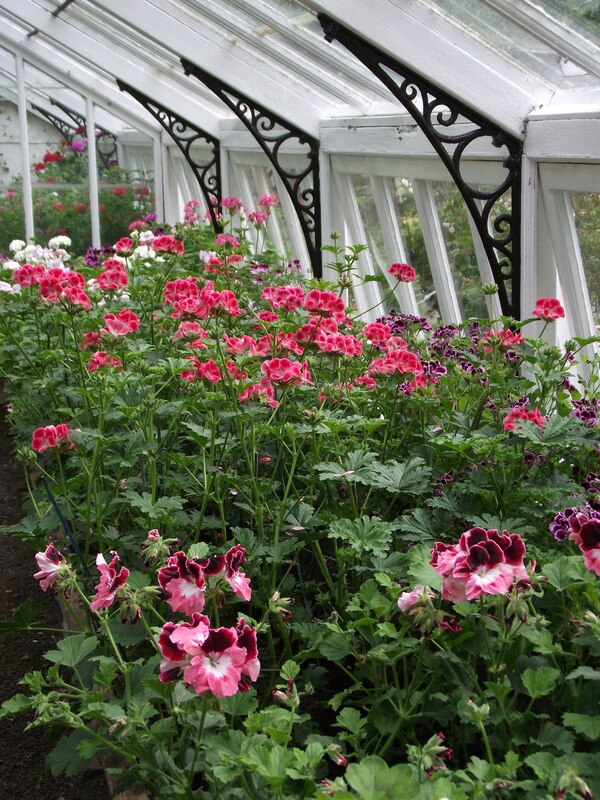 The greenhouses are stunning with huge displays of geraniums and many beautiful tender and rare plants. At last the vegetables too are in full production; we have gone from famine to feast and will have plenty to sell to visitors. Thank you to all our wonderful visitors who have written such kind and encouraging comments in our book. It means such a lot to the whole team here. Our room stewards, who have spent the last six months, mainly on their feet, explaining the finer details of each room to visitors, do such an amazing job and it is particularly nice to read such complimentary comments about them. Also what people seem to appreciate so much here is the fact that we are a real family home and not a ‘museum’ and we love to meet as many visitors as possible. 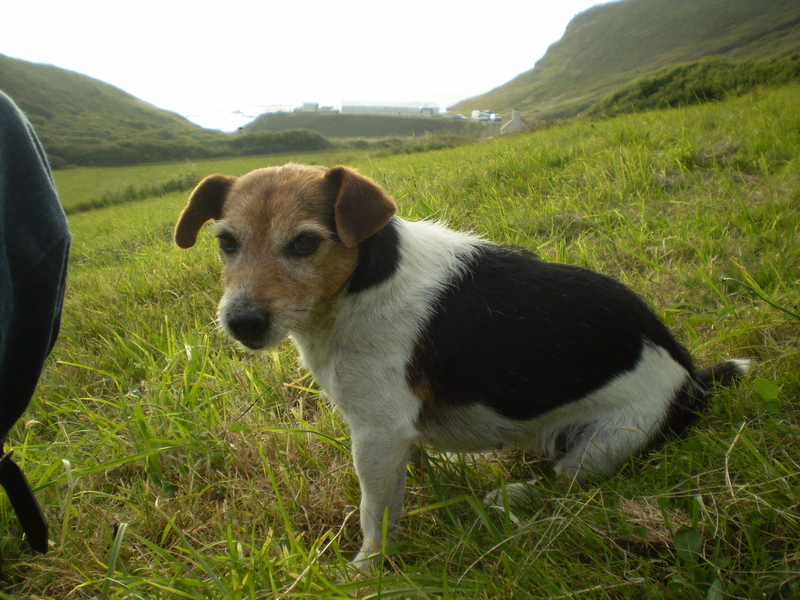 The only family member who is no longer able to be on public view is Alice, our adored Jack Russell, who has sometimes let the side down in the past by a nip here and there. Sadly I can no longer risk an increased 18 month prison sentence so she will either be seen firmly on a lead or will be in her very comfy basket out of sight! performances. Mr and Mrs Twit were truly disgusting! On Saturday September 1st we will be putting on a Heartbreak Theatre production of ‘Private Lives’ by Noel Coward which we are all looking forward to so much. 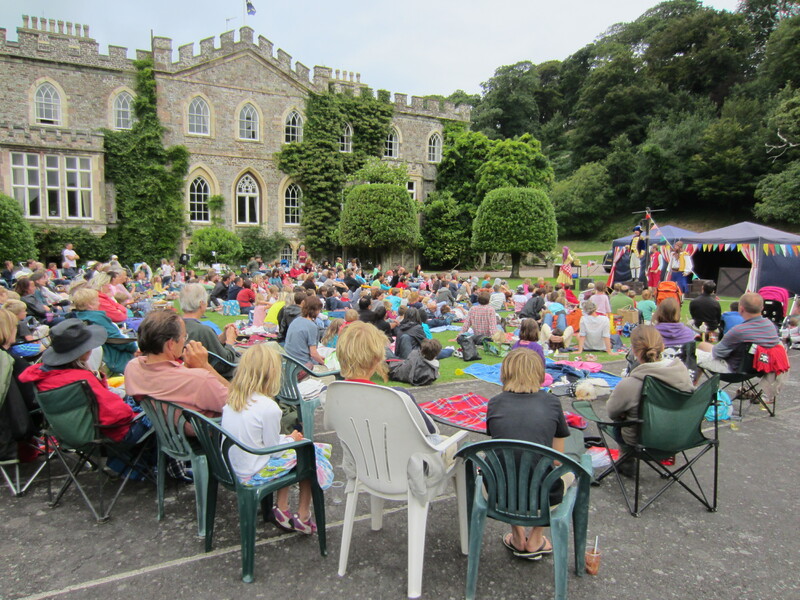 We will be sad when the theatre season is over as it has been such fun; the front lawn has been a great stage. We will again be providing the barbecue and the Pimms and Wine Bar and so it is uneccesary to bring a picnic if you are feeling like a real night off. It really is such a lovely evening out. seemed to be almost totally dry. 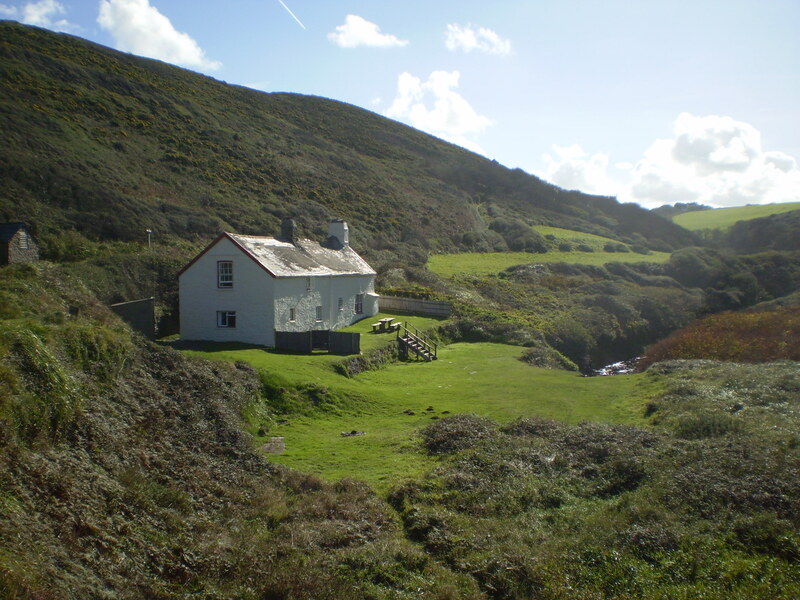 Hartland Quay with rooms overlooking the Atlantic, masses of sand on the beach at low tide and a great Wreckers Retreat bar and Tea Room, two really good camp sites: Stoke Barton overlooking the sea and Hartland site in the village and masses of really first class B and Bs. St Nectan’s Church in Stoke has a most beautiful screen and ceiling decoration. The church is huge and is known as ‘The Cathedral of North Devon’ with its tall tower reputedly used by wreckers in days gone by to lure unsuspecting ships onto the jagged and deadly rocks at Hartland Quay. 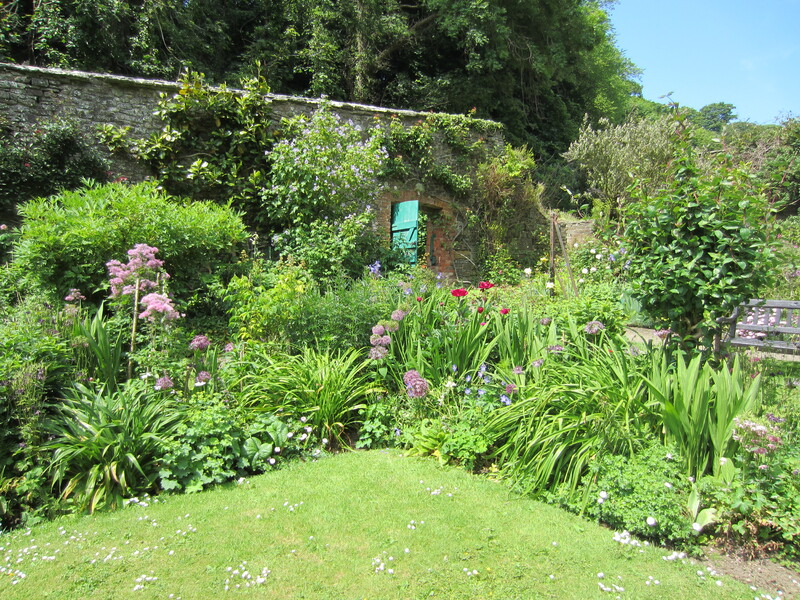 Docton Mill with its working mill and delicious refreshments has a really beautiful garden too. Last but not least some of the best beaches and surfing in the west country and Clovelly close by. 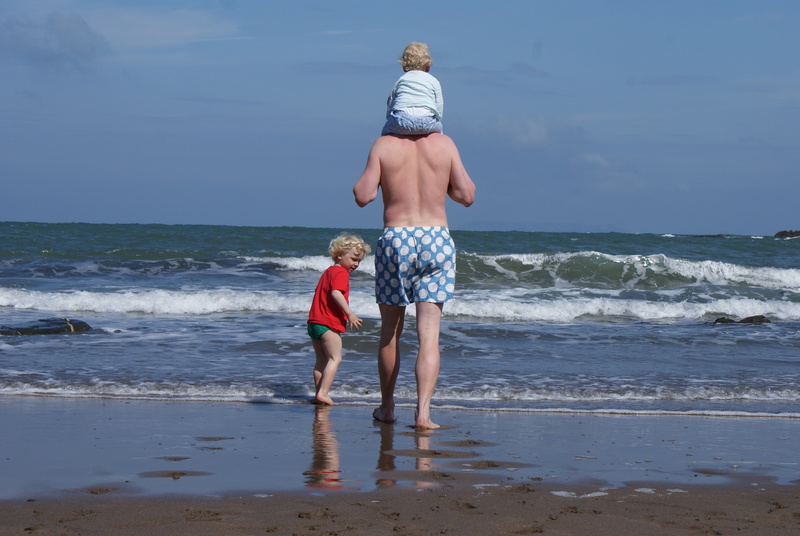 Our children and grandchildren adore it here and never want to leave as there is so much to do. The Flower Festival in the church, the Craft Fair and Car Boot Sale this weekend have been enormous fun and there is another wonderful Farmer’s Market coming soon so never a dull moment! Both the holiday cottages will have many more books on their shelves thanks to the Car Boot Sale where there were nearly as many books on sale as in a large high street bookseller! 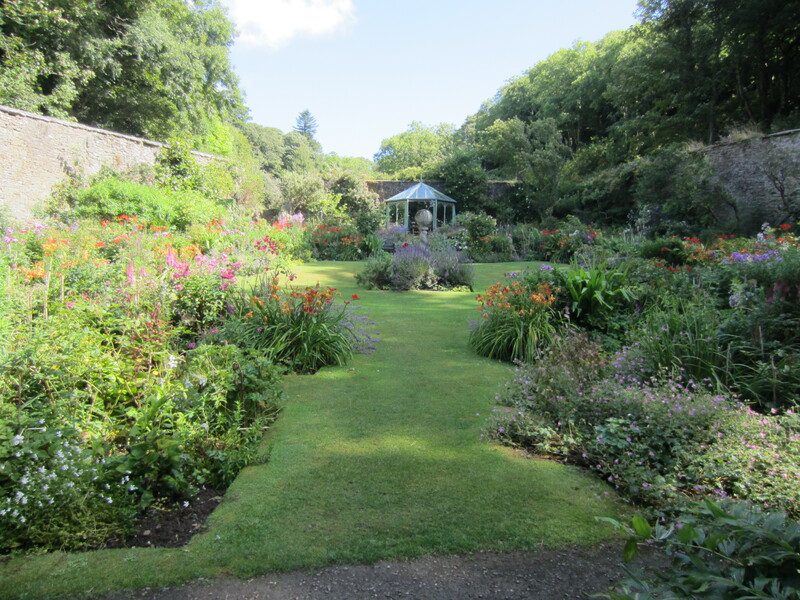 It is only a month now until we close at the end of September but there is still lots to look forward to in the gardens and ‘Private Lives’ on Sept 1st should be great fun. We still have on show the small exhibition of John Bampfylde’s recollections and mementos from the 1936 Olympic Games in which he was a membert of the British Fencing Team. He was my husband’s uncle who was sadly killed in the same year in a steeplechase at Taunton.